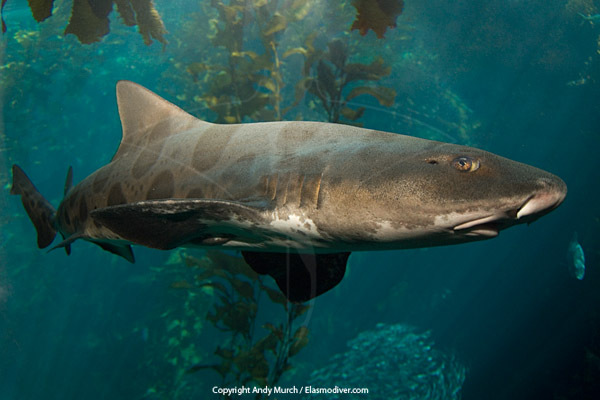 Shark talk, website updates, shark conservation rants, incoherent ramblings, etc. 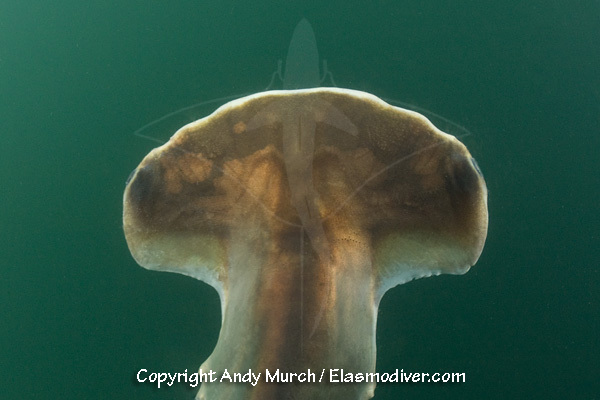 Not just Shark Pictures: Elasmodiver contains photos of sharks, skates, rays, and chimaera's from around the world. Elasmodiver began as a simple web based shark field guide to help divers find the best places to encounter the different species of sharks and rays that live in shallow water but it has slowly evolved into a much larger project containing information on all aspects of shark diving and shark photography. 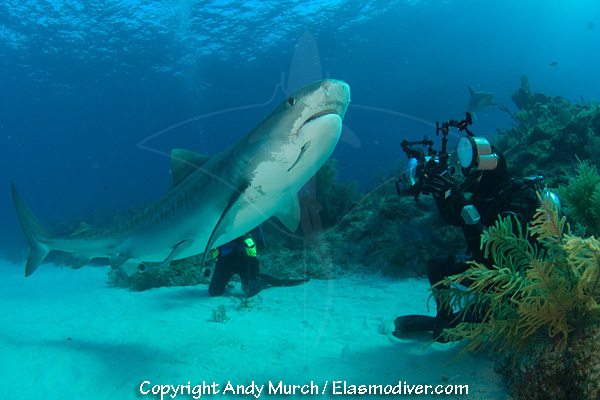 I have just returned from a Big Fish Expeditions trip to Tiger Beach and I have to say that Tiger Beach is no longer the best tiger shark dive in the world. Don't get me wrong, Tiger Beach is as sharky as it always has been with scores of lemon sharks ready to play as soon as the boat drops anchor and plenty of tiger shark action including regular visits from Smiley the resident tiger shark that has a damaged jaw leaving her with a permanent one sided grin. 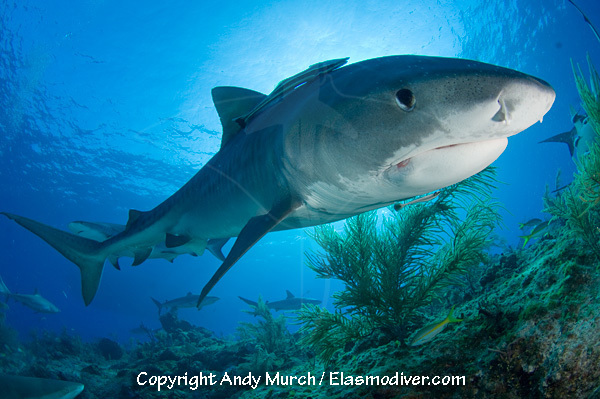 But there is a new site close to Tiger Beach that is even better for shark action especially if you're looking for dramatic backdrops for your shark portraits. 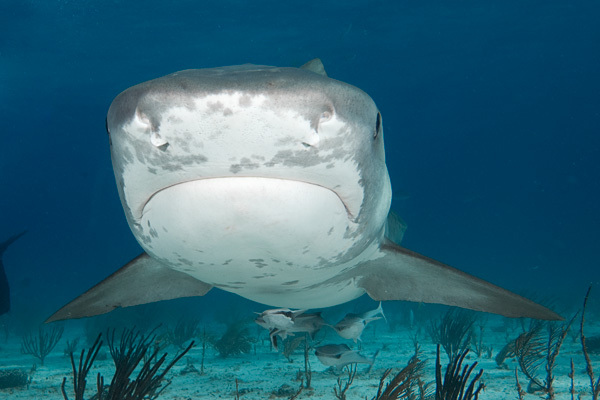 The reef is named Fish Tales but that's a bit generic for such a great shark diving spot so I'm calling it Tiger Tales for the tiger sharks that regularly wander by. 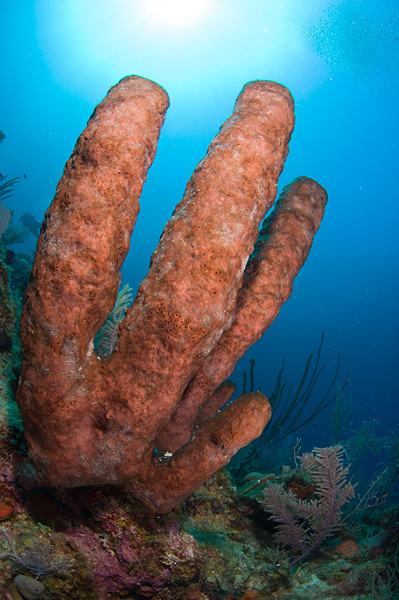 The site consists of a healthy coral reef in 40ft of clear blue water. 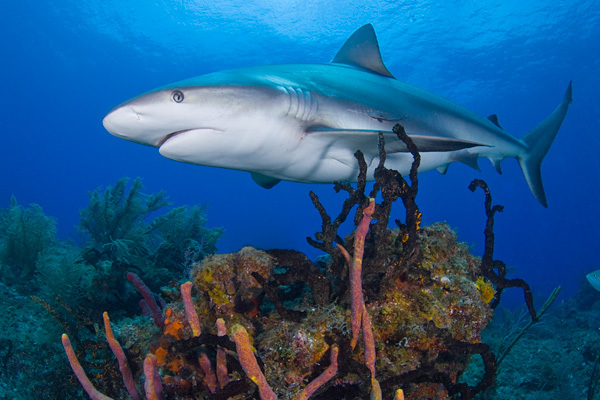 It is overrun with packs of bold Caribbean reef sharks and a few resident nurse sharks. There are always some lemons swimming around also and it doesn't take much effort to swell their ranks and bring in the tigers that inhabit the area. It was normal for us to see all four species of sharks on each dive and we even had a few flybys from one or two large great hammerheads but the hammers were too timid to approach the divers. Even before setting sail for the Bahamas, I was already in shooting mode. 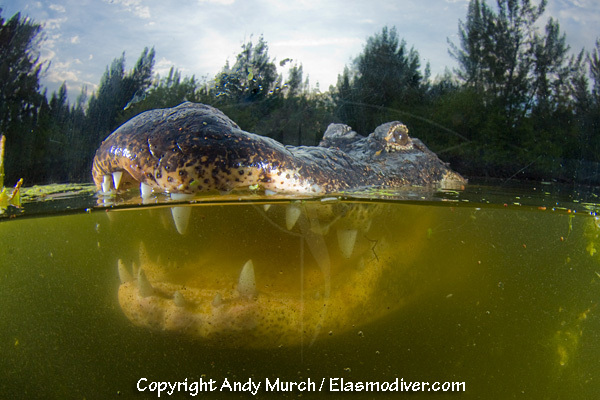 I spent a few days chasing American alligators in the swamps of South Florida with Film Maker Joe Romeiro. 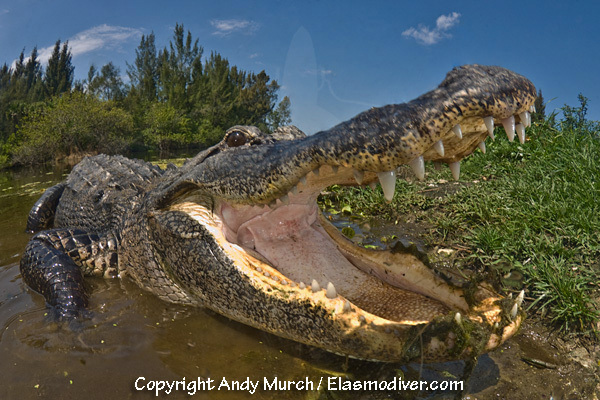 As I have no experience shooting big reptiles, I was pretty nervous being around the lizard king and wondered if I should have bought a pole cam with me to put a little distance between me and the gators but even the big animals were reasonably well behaved. 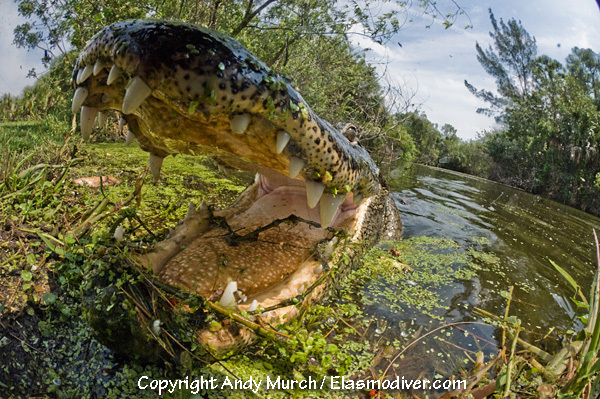 The images (shot with a fisheye lens) are an interesting addition to any shooter's portfolio and after posting them on my Facebook page I was asked if I planned to lead gator trips. Its an intriguing idea but I'll leave that to the experts for now. In March I spent some time in the Darien jungle talking to fishermen about the endemic shark species that live in the area. 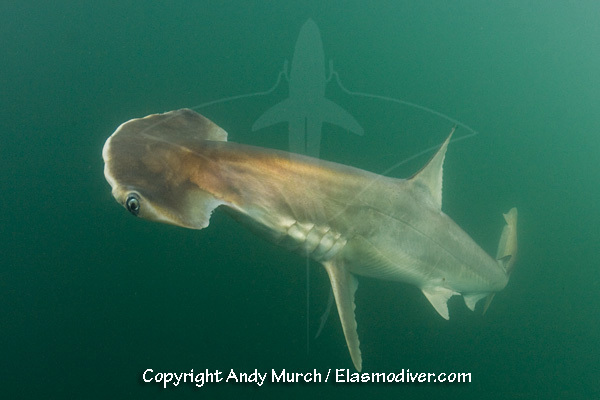 After a lot of hunting, I was finally able to get the first in-water images of a scoophead shark. 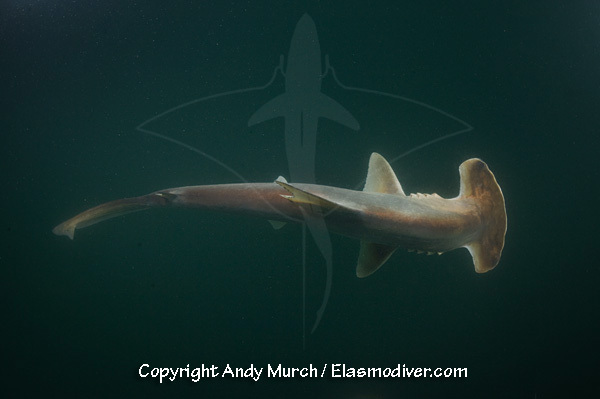 This is one of the smaller hammerhead species that has eluded photographers for so long. Scoophead sharks are far too timid to approach a diver no matter how much chum is in the water so to get the shots I spent a lot of time in a small panga shadowing the fishing boats as they pulled in their nets. The scoophead in my images came up on the last day of the trip and after a short negotiation involving the promise of a bottle of rum , the fishermen allowed me to release the ailing shark. 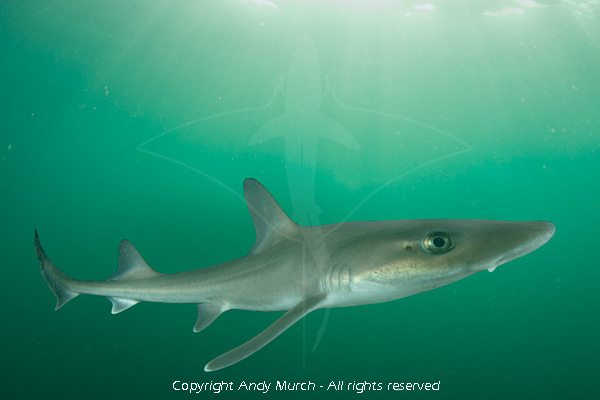 With global shark populations dwindling and inshore species with limited ranges (like the scoophead) particularly vulnerable to gill netters, obtaining representative images for conservation initiatives is extremely important. Its sad to say, but in some ways my one off expeditions to shoot the world's most illusive and endangered sharks, are my way of recording archival footage of species before they are gone. 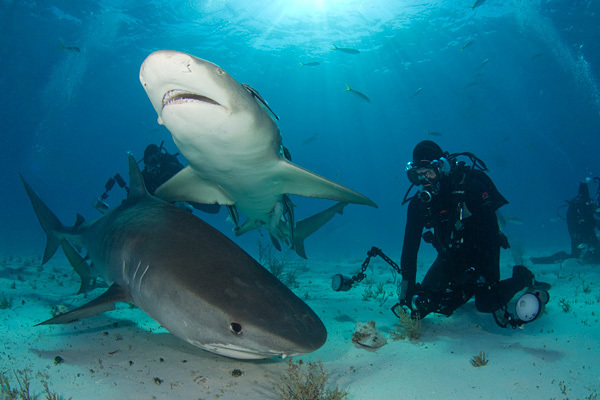 THE OCEANIC WHITETIP SHARKS OF CAT ISLAND, BAHAMAS. Another shark that has seen better days is the oceanic whitetip. 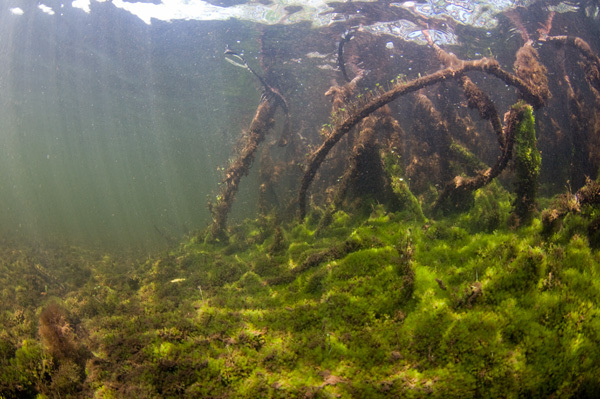 Virtually eliminated from the Gulf of Mexico, there are few places left where oceanics can be reliably found. 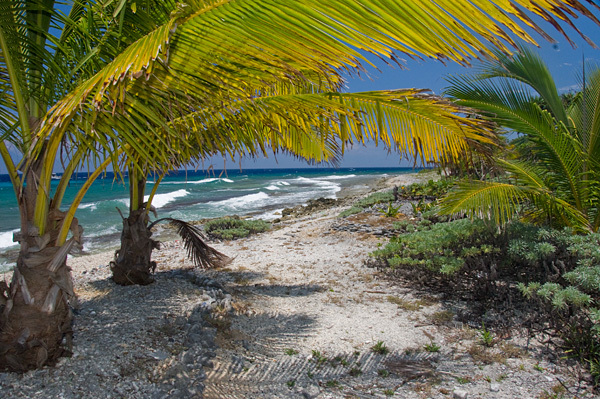 One of those places is Cat Island on the eastern edge of the Bahamian chain. In May of this year, I will be joining 7 guests on a week long land based expedition to dive with these ocean ocean predators and a handful of other shark species that call Cat Island home. On the first weekend of August.... Sharkfest is back! If you missed the action last year there is a trip report on the epic shark diving that we enjoyed, plus film screenings and fun. 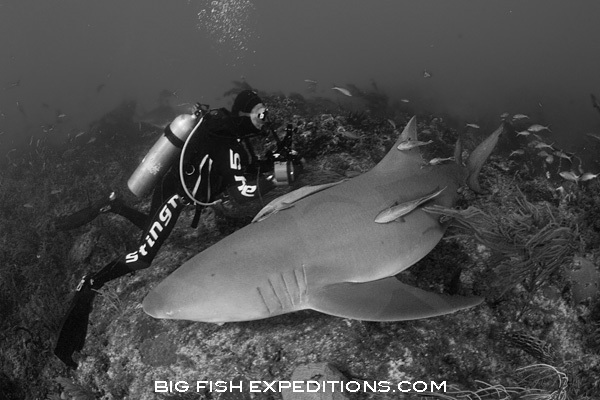 This year we're stepping it up by adding a night dive with the sandtiger sharks on our first day. Space on the boat is limited and right now there are only five spots left so sign up now if you want to come. 3 days of shark diving, dorm accommodation, BBQ, film screenings, and a Sharkfest Tee Shirt $640. 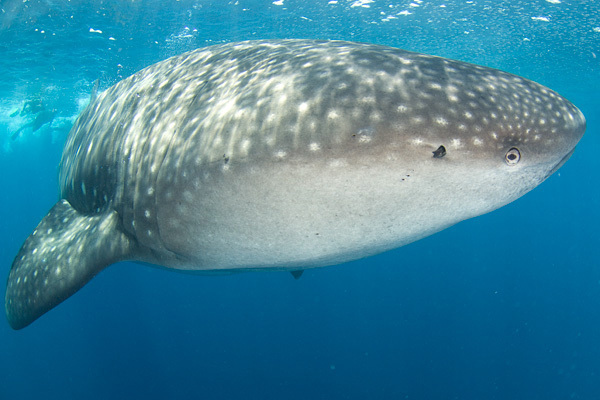 Later in August we'll be chasing humboldts and whales in the Sea of Cortez (only 4 spots left). This will no doubt be the most eclectic trip. 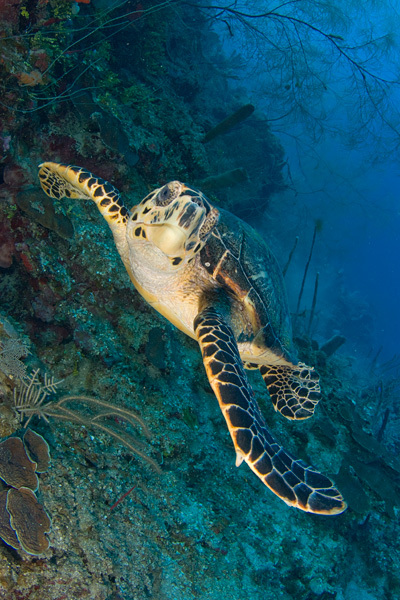 In a nut shell we'll be diving Baja's best reefs each day while we cruise north to Loretto. Between dives we'll be scouting for fin whales, sperm whales and pilot whales to jump in the water with. 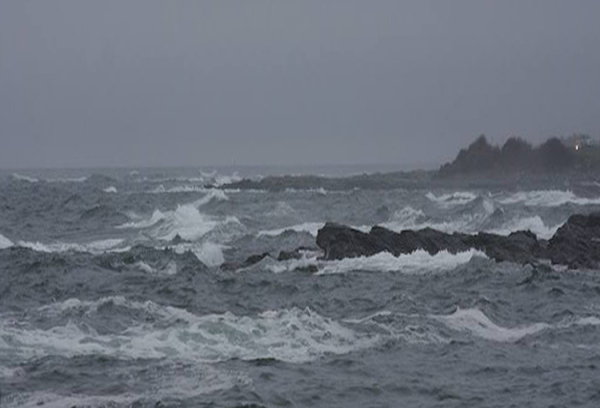 Once we get to Loretto we'll be diving by day and jigging up humboldts in the evenings and hopefully getting in the water to shoot free swimming humboldt squid if everything goes to plan. As if reefs, whales, squid and sea lions wasn't enough, the operator has agreed to let me try chumming for sharks at some locations. This is a bit of a wild card and we are not sure what species (if any) will show up but we can't go all the way to Baja without looking for sharks. There are no links on the Big Fish Expeditions Website for this one yet so I'll be blogging about it more in the next update. 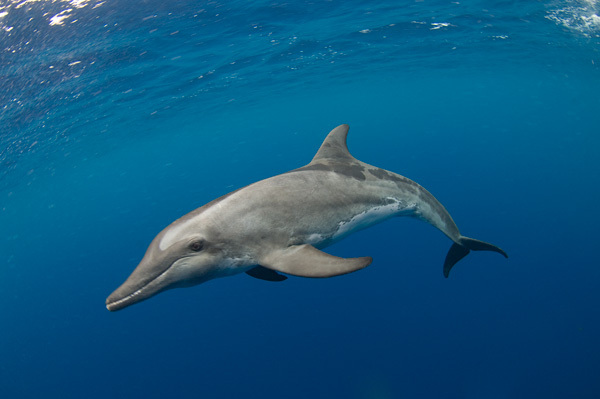 But to give you a brief idea, at Malpelo (a day's boat ride off the coast of Panama) you can expect to see schooling scalloped hammerheads, silky shaks, Galapagos sharks, random sightings of mantas and whale sharks, and many other pelagic visitors as well as reefs crawling in morays and large stingrays. 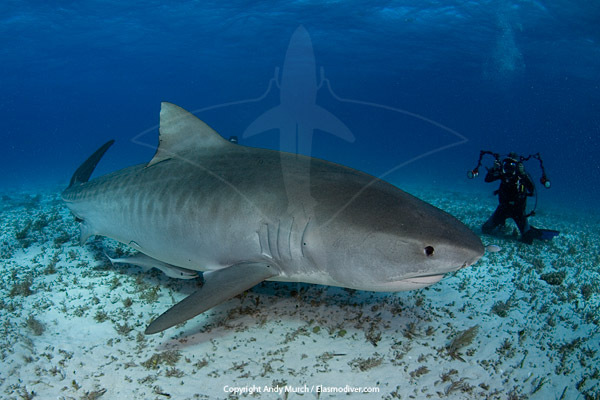 But in February and March on the deeper reefs around the rocky island, there is the chance to see enormous Smalltooth Sandtiger Sharks (Odontaspis ferox) which are the sandtiger's big cousin from the depths. If you think you've seen it all you have to dive Malpelo. We'll be on the liveaboard Inula. Although I have barely talked to anyone about this trip there are only 6 spots left so please send me an email if you want more info. 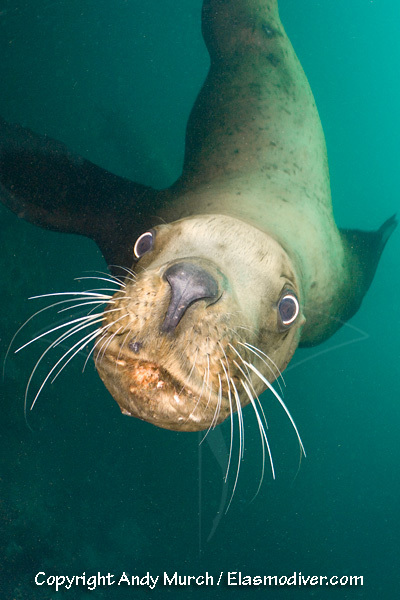 Between expeditions, I'll be enjoying the diving around Vancouver Island with Pinnacle Scuba Adventures. Pinnacle is southern Vancouver Island's newest and most versatile dive charter operator. We'll be diving some of the best sites on the south end of the island and exploring new locations each week throughout the summer. Join us if you're up this way. 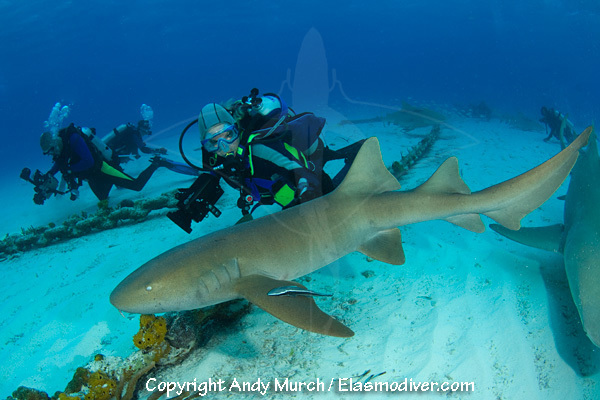 2011 is shaping up to be an exciting year for shark diving. A few weeks ago, divers in Mexico were treated to the first ever encounter with a longfin mako; a species which has eluded photographers since the invention of the aqualung. As always, time in the water is the key to rare encounters. The more you dive, the more opportunities you have to be the person that gets the money shot or enjoys that memorable encounter that you will be talking about for years to come. 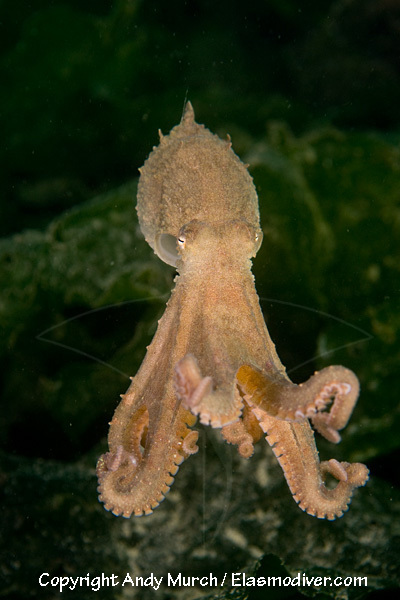 After a long, cold winter of diving in the Pacific North West and writing articles, cleaning up images from 2010 and dreaming about diving under tropical seas, it is finally time to dust off my dive gear and jump into the next adventure. 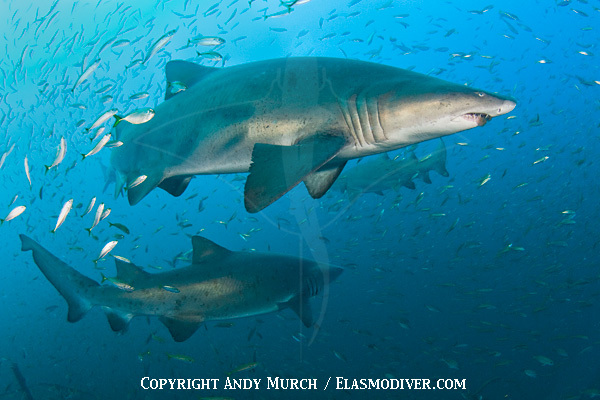 Before the first Elasmodiver/Big Fish guest trip to Tiger Beach in early April, I have an 'off the beaten path' expedition planned to the Bay of Panama for the Predators in Peril Project. 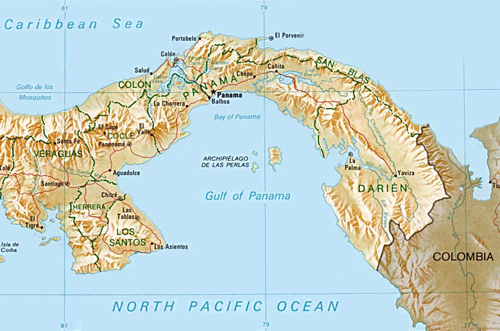 Right now I am on my way to Panama City to meet up with a contact in the Panamanian government who believes that he can get me out on a panga with the local shark fishermen. My goal is to document the taking of (and hopefully the release of) two tiny species of hammerhead shark that have never been photographed by a diver. The images (if I get them) will be used to draw attention to these lesser known species in an effort to generate support for conservation measures. Its not going to be an easy shoot. The sharks are rarely seen even by the fishermen themselves but this is the right time of year to go and if I wait until next year there will be even fewer animals left to find. Wish me luck! Far from the glamorous impression that some divers have of the life of a traveling photojournalist, This will likely be an uncomfortable, sad and frustrating expedition. Fortunately, as soon as I return to North America, I will change lenses and head to the Bahamas for my annual Tiger Beach Photo Workshop. 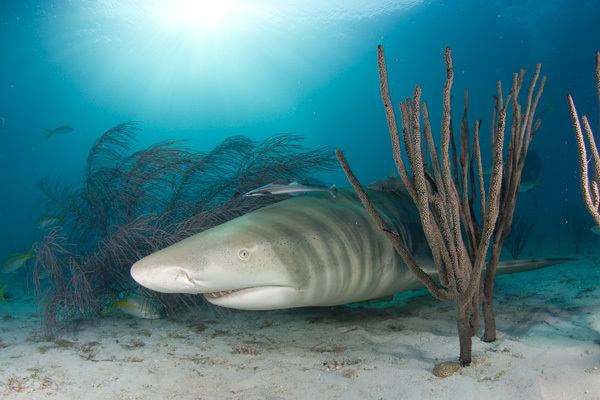 Tiger Beach is truly a spectacular location where you are virtually guaranteed the opportunity to dive with big tigers and scores of lemon sharks. This will be my 6th season at TB but it still feels like there are new shooting angles waiting to be explored and once a year is just not enough! There was one cancellation on the trip so if you're looking for an incredible experience let me know. After Cat there is another Predators in Peril Expedition in the works. This time I'll be hunting some very deepwater sharks with researchers from a University in the Caribbean. 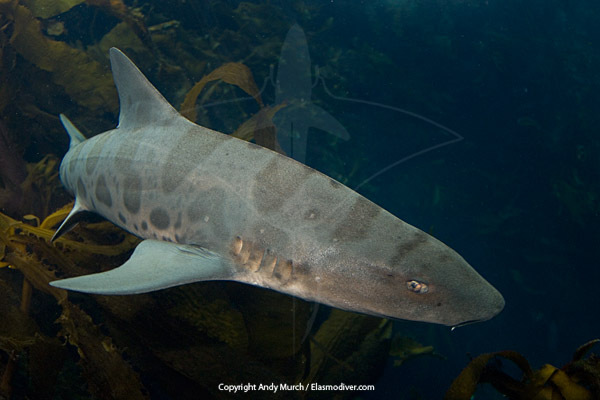 I won't mention any species until I get the shots but I'm very excited at the prospect of shooting some bizarre green eyed squaloid sharks and catsharks that few people have ever seen let alone photographed! Beyond that there is an expedition to Kalimantan in the works and then another attempt to organize a bull shark trip to Playa Del Carmen. The last guest trip (scheduled to take place in early February) was cancelled after the aggregation of Bull Sharks was virtually wiped out by local shark fishermen. Although the shark dive operator began chumming in new sharks there is nothing in place yet to make sure that the new arrivals don't meet the same fate so I'm not going to confirm any dates until I'm convinced that the sharks are locally protected. This summer you can also expect to be invited to join a 'drysuit only' diving safari on the dynamic and outrageously colourful reefs of Vancouver Island. British Columbia, Canada has an amazing diversity of marine life. 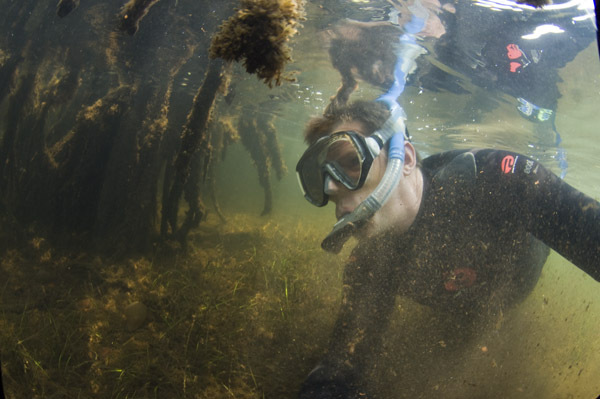 Jacque Cousteau dubbed the northern reaches of Vancouver Island as 'the best cold water diving in the world'. He was right! Steller sea lions, giant pacific octopuses, stubby squid, nudibranchs as big as your hand, healthy schools of rockfish, enormous bull kelp forests, sunken warships and reefs packed with sponges and invertebrate life are just some of the things you can expect on a daily basis. Whether you're a macro maniac or a wide angle shooter there is plenty to keep you snapping away. 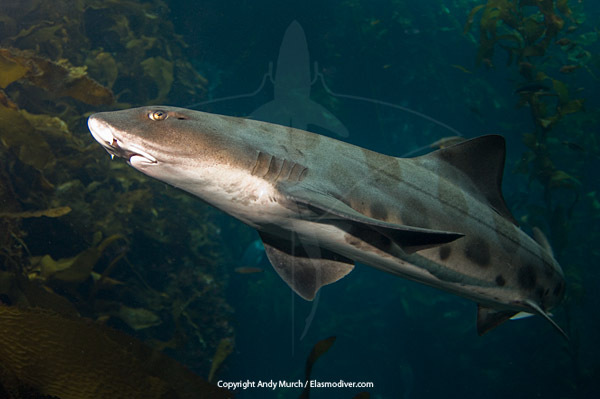 There is even the chance of a North Pacific Spiny Dogfish or two (which was recently identified as a new species completely distinct from the spiny dogfish that lives elsewhere on our big blue planet) and the slim but tangible chance of encountering a lumbering bluntnose sixgill shark. Time in the water is what it all comes down to. I look forward to seeing many of you out there. Last year, more than a million people spent some time clicking through Elasmodiver's 400+ pages of information and shark images. Hopefully, some of them took away a little more knowledge and respect for our world's endangered Elasmobranchs. It is important to me to keep expanding the shark and ray field guide, but as I slowly tick off the few remaining shark and ray species that are relatively easy to dive with and photograph, I find myself planning increasingly more abstract expeditions, often working with researchers and sometimes even commercial fishermen. There are parts of the world like Southern Africa that I have been purposely avoiding. I could probably find a dozen new species in a week or two of diving around Cape Town but before I take off to such exotic locations, there are a number of elasmos from North America that still need some time in the spotlight. There are a couple of hammerheads from the Pacific slope that are virtually unknown and a number of Central American smoothhound sharks that are heavily targeted by the artisanal shark fishing fleets. Those species come first. 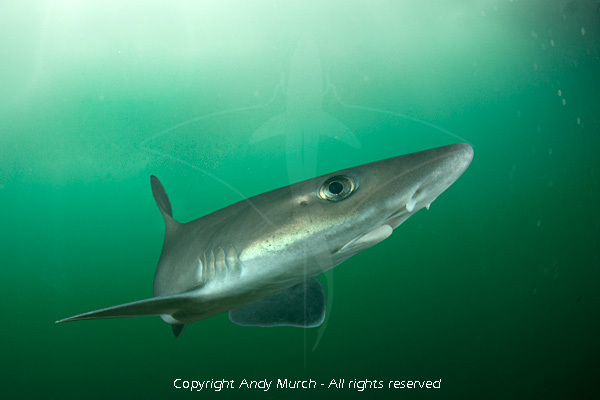 The latest shark species that was added to the Field Guide (a few weeks ago) was the Dusky Smoothhound. 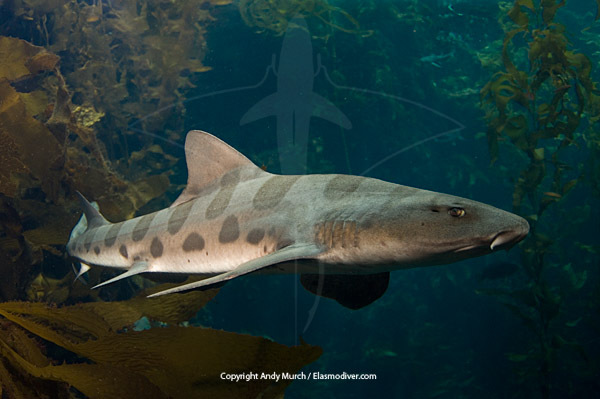 Smooth dogfish (as they are called in New England) are very common sharks but they are rarely encountered by divers. 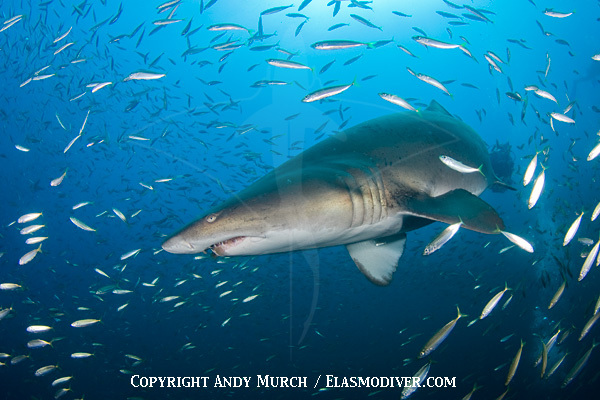 Getting these images involved a trip back to visit my shark diving buddy Joe Romeiro in Rhode Island. Although we did everything we could to try to shoot a dusky smoothhound in the wild, we eventually gave up our fruitless search and found an aquarium that would let us shoot in their tank. A natural encounter would have been better but sometimes, this is the only way to get the shot. A big thank you to Biomes Marine Biology Center for letting us work in their excellent facility. If you know your way around Elasmodiver, then you'll have noticed that there are a lot of new links pointing to Big Fish Photography Expeditions. This is our brand new expedition website that showcases all of the trips that you can join me on to meet the world's top predators on their own ground. These are not your average wildlife expeditions. They are one of a kind adventures tailored to adventurous people that want to enjoy up-close, in-water encounters with apex predatory sharks, whales, dolphins and even giant squid. Our first expedition kicks off in February next year in Playa Del Carmen, Mexico. Playa has recently become a hot spot for bull shark encounters and the Bull Shark Feed that takes place there from November to March is second to none. I am timing our bull shark diving adventure to overlap with a scientific shark tagging expedition which is being conducted by Dr Mauricio Hoyos who is Mexico's leading Great White Shark Specialist. Mauricio and I worked on a white shark film together a couple of years ago and he has agreed to do a talk about his white shark research on Guadalupe Island and explain what he hopes to learn about the bull sharks in Playa. 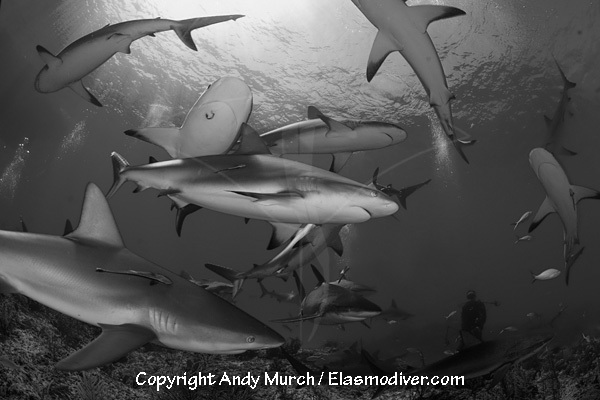 I have some great ideas for creating the perfect shooting environment and if the sharks cooperate I expect that we will return with some amazing images. In April I will be running a second Tiger Beach Photography Workshop. 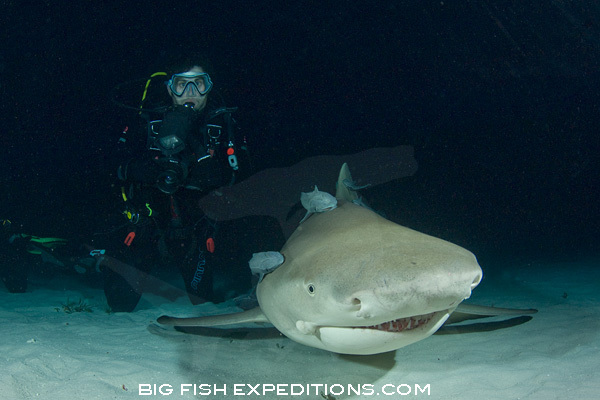 This year's trip was a bit hit with scores of lemon sharks and 24/7 tiger shark action, not to mention encounters with reef sharks and nurse sharks too. For some people it was their first introduction to shooting big animals. For others it was a chance to hone their skills. I'm looking forward to getting back there and doing it again in 2011. Next year's boat is already half full so if you're interested in joining us please let me know as soon as possible. I guess that's more than enough bragging about expeditions. 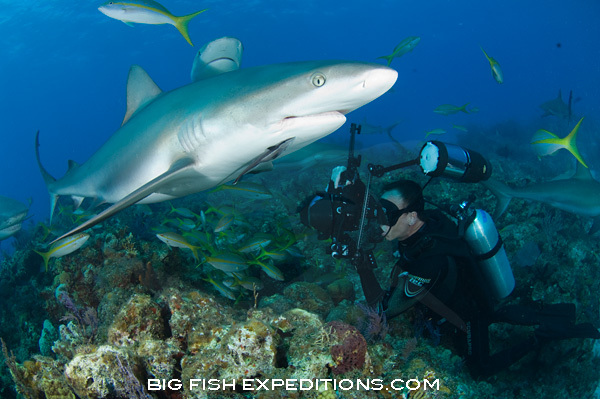 The ones we have scheduled so far are all listed on the Big Fish Photography Expeditions website. I'll update you on new expeditions that I intend to run, as soon as they come together. This year is quickly getting away from me. Fortunately, late summer is the time when things start to get interesting here on Vancouver Island so I am dedicating the next month to the Pacific North West Elasmo Hunt. Next weekend I will start by working on the wild west coast in an area called Barkley Sound which is a great place to track down sixgill sharks. I already have some sixgill shots but I'm hoping to improve them and get a much better variety that really capture the bluntnose sixgill's enigmatic personality. We have our bait crates ready to go and a boat rented for this very purpose. If any local divers want to join us on the hunt, there may be a few spots up for grabs. 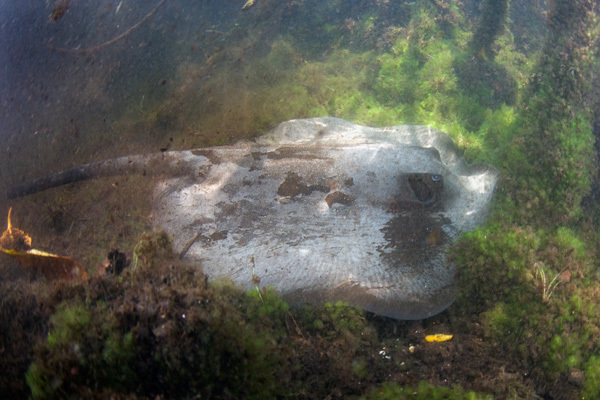 Late summer is also when deepwater skates start making their way into the shallows to feed on crustaceans and other benthic invertebrates, so I'll probably be spending a fair bit of this month swimming around in muddy featureless bays, hoping to encounter a skate or two. Wish me luck! 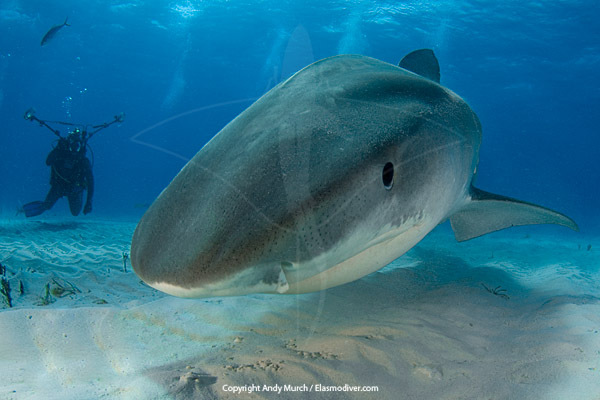 After shooting three new species of deep water skates in Rhode Island (see previous post), I flew down to West Palm Beach to meet up with a group of keen shark photographers that were accompanying me on the Tiger Beach Shark Photography Workshop. The expedition was a huge success. 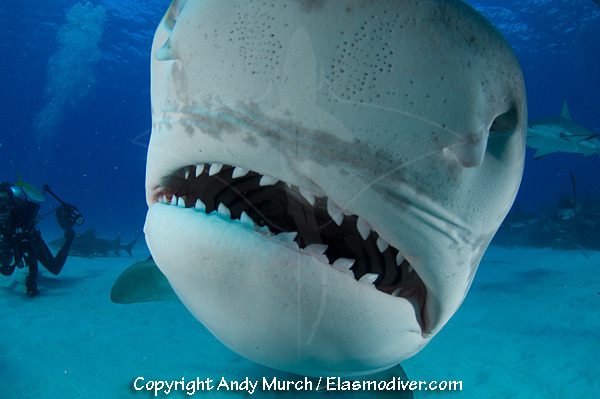 Tiger Beach always has a healthy supply of lemon sharks (usually around 40 or 50 once the chum gets going) but the tigers themselves can be hit and miss. 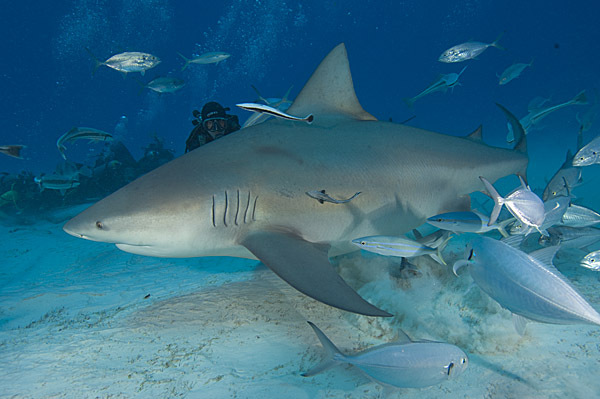 Its important to have a solid player - a shark that isn't afraid of cameras, swims close to the group and stays around long enough for everyone to get the shots they want. Fortunately, that is exactly what we had. Other sharks came and went but one respectably sized tiger shark stayed with us for the entire week. 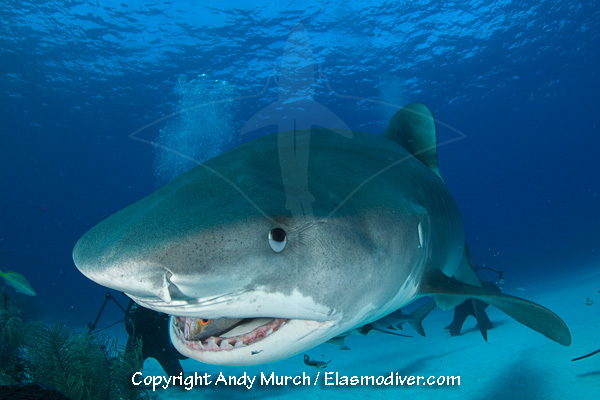 I think that everyone got more tiger shark shots than they knew what to do with. I wanted everyone to come home with great shots, a better knowledge of workflow (Bridge, Photoshop, etc) and some amazing stories about close up encounters with big sharks. I think everyone learned a lot and had a great time and I'm really looking forward to doing this again next year! 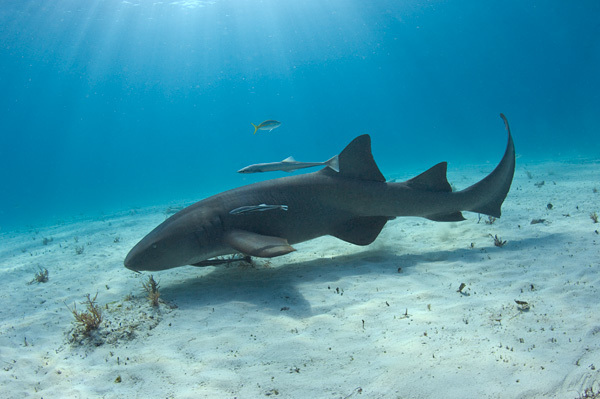 As well as lemons and tigers we had one little nurse shark that kept skirting the action. He was pretty brave to get as close as he did with all the huge carcharanids milling about but the poor guy never made it to the food. 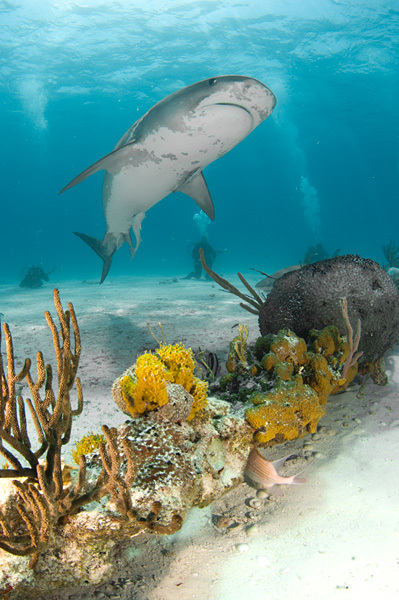 We spent the entire week exploring all the different photography opportunities that Tiger Beach has to offer except for one afternoon that we snuck off to a deeper site to chase Caribbean reef sharks. After the big lumbering lemons it was great to play with some zippy little sharks for a few hours. Everyone hunkered down next to the reef and snapped away while the sharks buzzed back and forth above us perfectly framed against the clear blue Bahamian water. 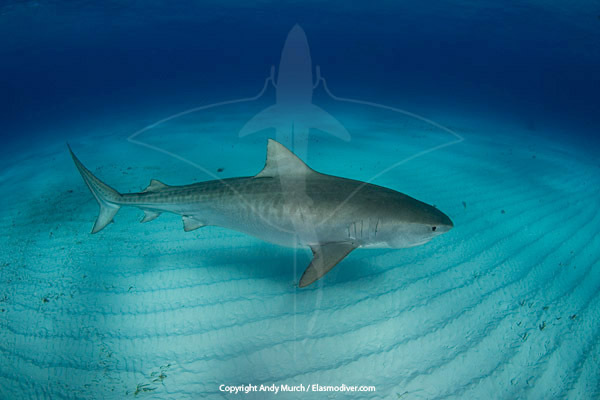 We returned to Tiger Beach to find our super model tiger shark still in residence and continued looking for the perfect shot until it was time to pull anchor and head back to Florida. After bidding farewell to a boat load of new friends, I packed up my cameras and took a flight to Honduras. Steve Fox (Owner of the luxurious Deep Blue Resort in Utila) had graciously invited me to come and photograph a couple of deep water shark species that local fishermen sometimes encounter on the deep coastal plains around the island. Both species we were after are rarely if ever photographed and both are data defficient according to the IUCN Red List. They are caught incidentally in other fisheries and like many deep sea species they are probably in decline. Sadly, if you chase rare sharks you have to expect to strike out now and then and on this trip the sharks eluded us. 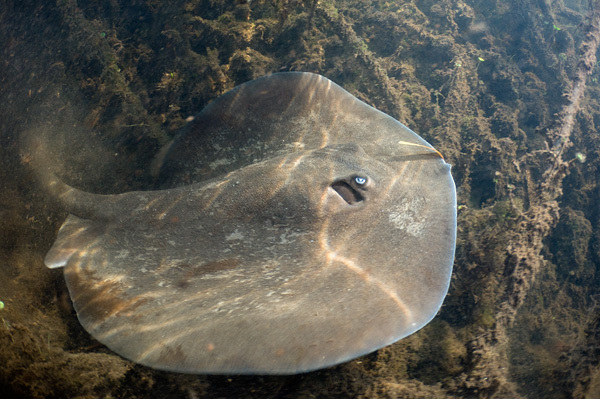 Cutting my losses, I spent the next week snorkeling in a muddy lagoon looking for a rare stingray called the chupare stingray (aka Caribbean whiptail stingray). Steve (who has a cutting British wit) ribbed me relentlessly during the week when I wasn't able to find one. He was adamant that they were all over the place if only I'd open my eyes, but trying to shoot one in the low visibility environment was an extremely challenging mission. 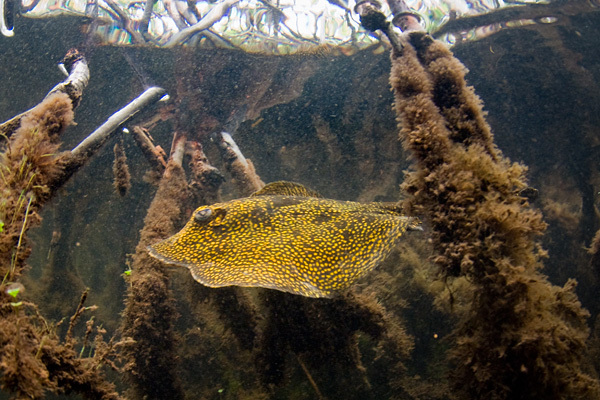 Through a combination of luck and stubbornness, I finally cornered a ray in a pocket of mangrove and fired off a fusillade of shots while the ray kicked up more and more silt until there was nothing left to see. Although I didn't get the quality of images I would have liked, I did take some usable ID shots so the trip was officially a success. 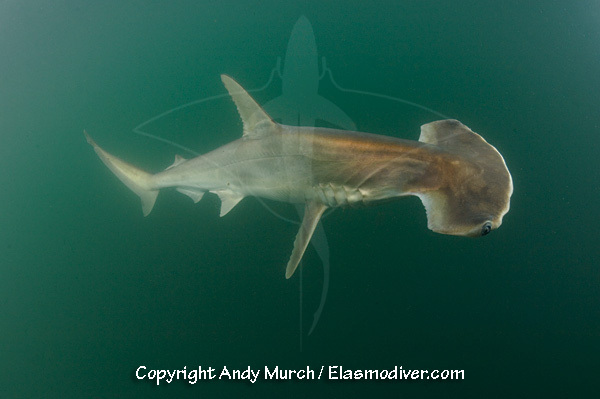 One more species for the Elasmodiver Shark and Ray Field Guide. Tired of swimming around in lukewarm tea all day, I decided to take a break and head out to see some of Utila's beautiful reefs with the sensible divers. 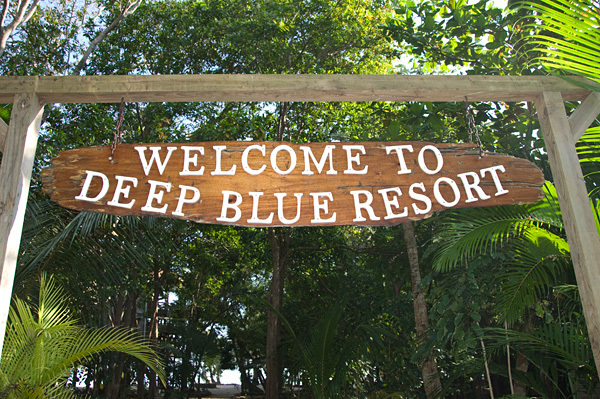 Deep Blue Resort has a seamless system for delivering divers to wonderful environments and encounters: After a leisurely breakfast, you simply stroll onto Deep Blue's private dock and get whisked off to a stunning and dramatic wall dive somewhere then climb back on board and slip out of your dive gear while the crew find you some whale sharks to play with. Then you jump in, snorkel with the sharks (which are conveniently feeding at the surface on baitballs) and pop back onto the boat once the sharks move too deep. 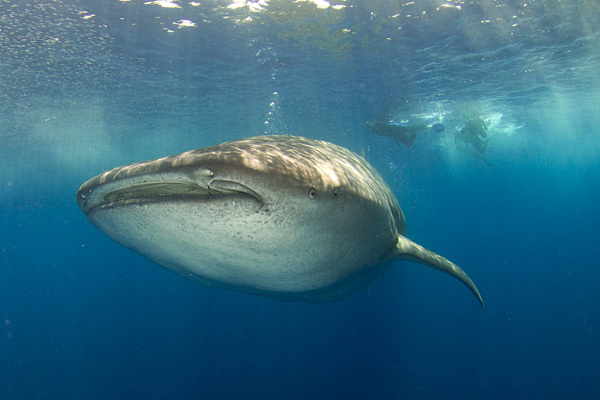 This is repeated time and again until the guests get tired of 'whale shark jumps' and ask to be taken to another pretty dive site. 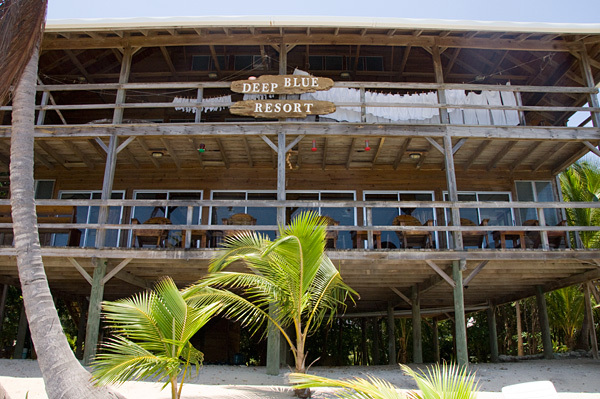 After a pleasant lunch back at the lodge, guests are then invited to head back out on the boat for more absurdly easy diving or enjoy a shore dive on the house reef. After a week of paradise they all fly home feeling ten years younger. It's painfully easy. Its been so long since I did any 'recreational diving' that at first I couldn't remember what I was supposed to look at. 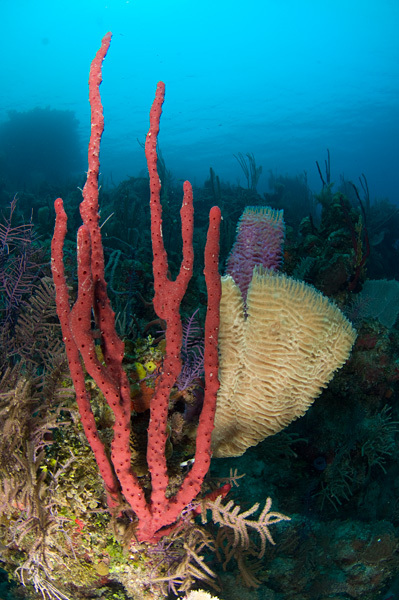 After a while, I settled in and started shooting pretty sponges and coral formations but it still felt kind of weird not being on a shark photography mission. The whale shark jumps were much more familiar and I was happy to have the chance to snorkel (if only briefly) with a couple of big animals. Having got my fix of big aquatic animals, I decided to head back into the lagoon for one more crack at the Caribbean whiptail rays. 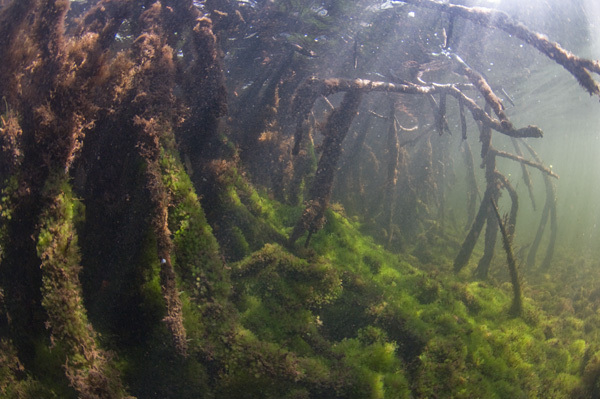 The vis had improved enough to see the mangrove forest in all its glory but the rays were nowhere to be found. 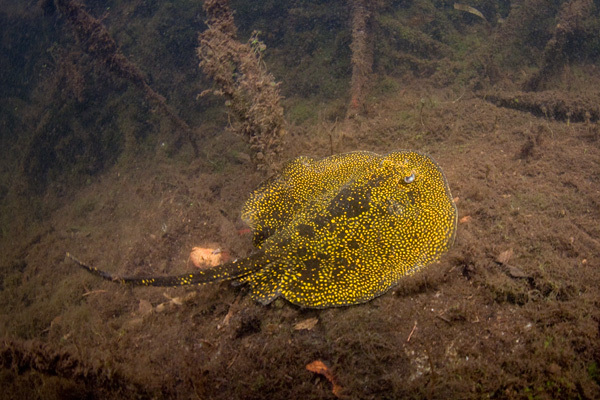 What I did stumble upon was a urolophid ray (round stingray family) that I can't positively identify. 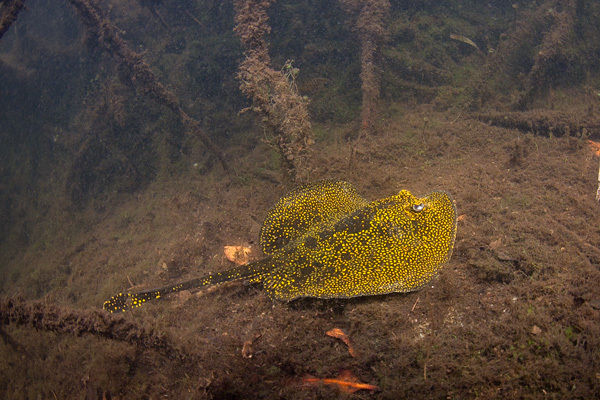 It was probably just a yellow spotted stingray but rather than the usual tiny yellow spots on a pale background this little ray was jet black with vividly contrasting orange/yellow spots. I've never seen this color variation before but then again I've never spent a week snorkeling around a Honduran lagoon. Tallying up the elasmobranchs from the entire trip, over a 5 week period I managed to shoot nine species of sharks and rays and saw two more species distantly swimming along. Not a bad first adventure for the new decade. I'm hoping to attend the American Elasmobranch Meeting in July in Providence, RI. If any of you sharkafiles will be there please let me know. After that, my next big trip will be Sharkfest. 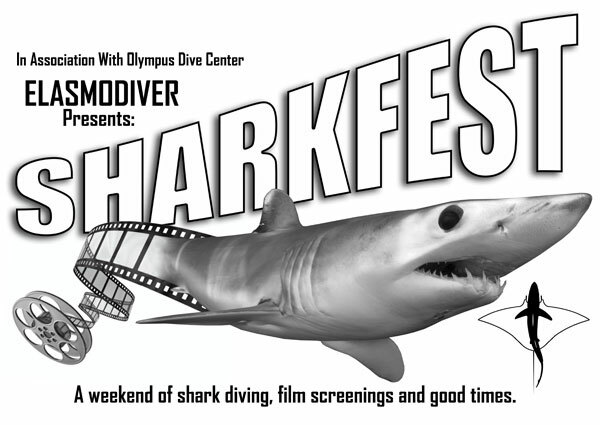 Sharkfest is three days of sandtiger shark diving with a mini shark film festival attached. It's my humble attempt to bring together a whole bunch of shark divers to dive, watch movies, tell stories and have some fun. If you would like to attend there are 3 spots left on the boat. Email me for details. 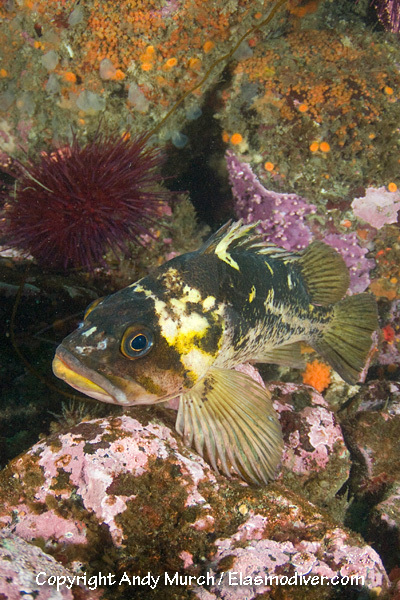 For now I'm back on Vancouver Island cleaning up pics, writing stories, diving with local species and plotting. 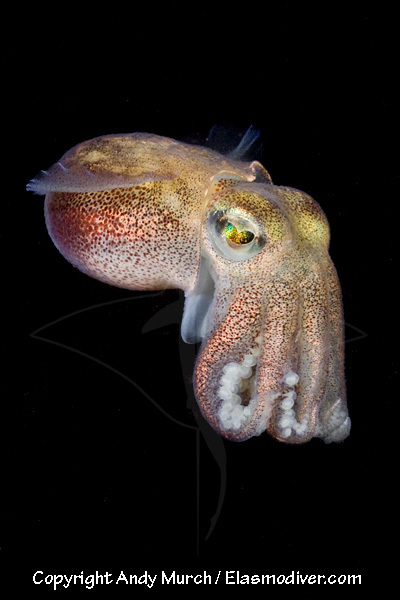 I may be running an underwater photography workshop here in Victoria over the summer so if you're up in the Pacific North West and want to learn the basics of DSLR photography let me know! An Incoming Tide of Adventure. Like a stingray stranded on a mud flat, I have been stuck on land for way too long. I spent the winter working in other fields to raise a shooting budget for 2010 and with that taken care of, its time to embark on a six week expedition through New England, Florida, The Bahamas and Honduras. The plan as always, is to shoot as many new species of sharks and rays as possible. Right now I am in Rhode Island. Home to makos, blues, threshers, the occasional white shark and lots of deep sea skates. 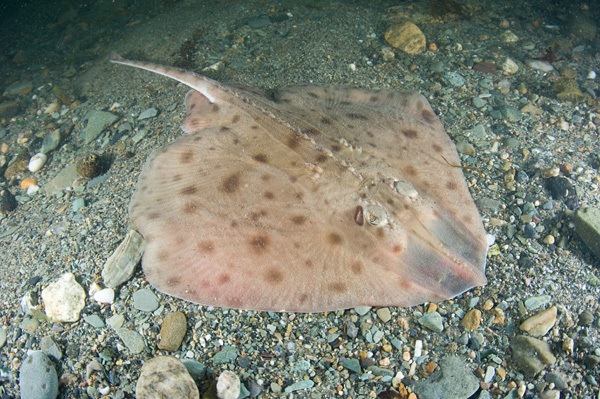 For those that don't know, skates are a type of ray and are therefore closely related to sharks. 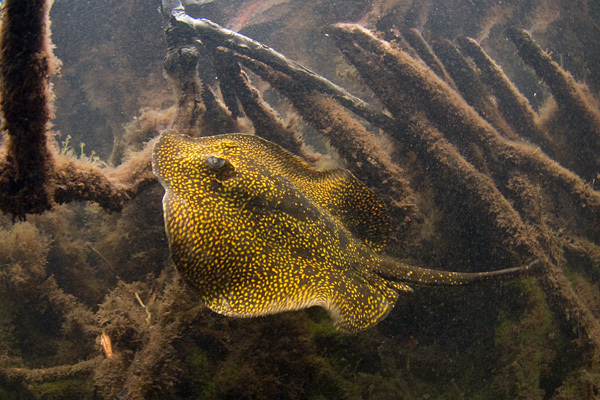 One big difference between skates and other rays is that skates lay eggs. They are also very specious. If fact, they are the largest of all shark or ray families and because most live in very deep inaccessible areas, scientists are still finding new species on a fairly regular basis. I am particularly interested in shooting barndoor skates which Greenpeace International recently added to its Seafood Red List. Greenpeace's red list is a list of fish that are commonly sold in supermarkets around the world, and which have a very high risk of being sourced from unsustainable fisheries. 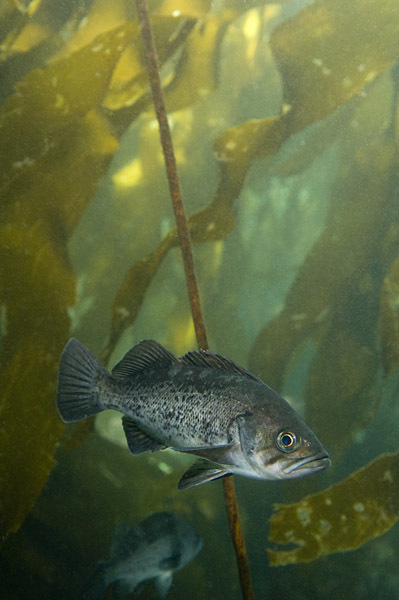 On the other hand, NOAA recently downgraded the barndoor on its 'species of concern' scale but the continuing directed fishery and high by-catch levels make it an ever-vulnerable species. 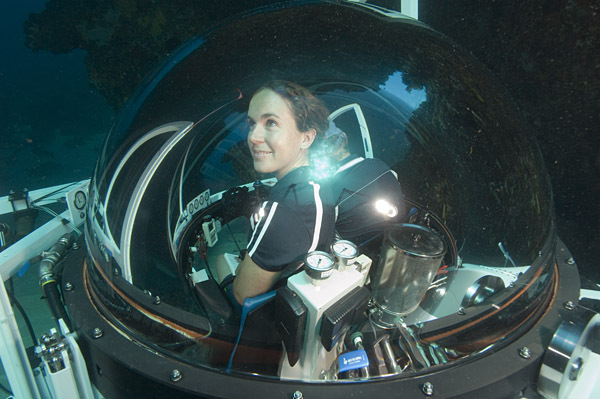 You can't dive with deep sea skates in their natural environment unless you happen to own a research submersible. 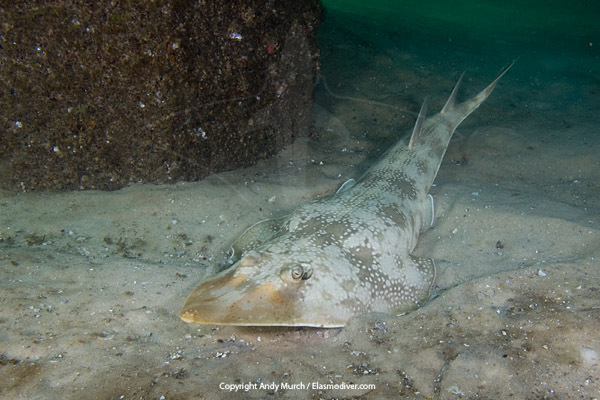 Sadly, a sub is out of my budget this year but I have a buddy named Brian Raymond who works on a fishing trawler that often plies the waters of The Georges Bank where barndoor and other skate species are fairly common. The boat that Brian works on mostly trawls for squid but trawling is an indiscriminant form of fishing so the by-catch levels are often horrendous. 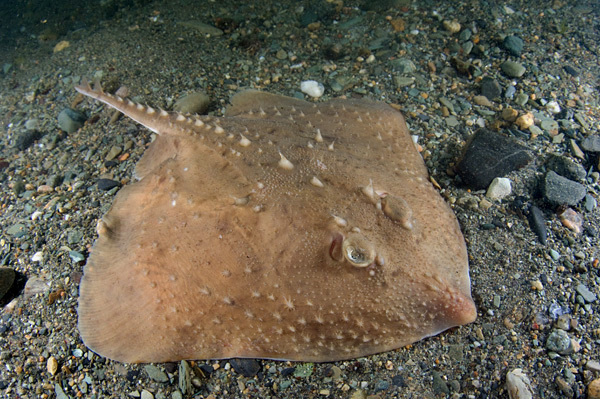 Recently, they have been dragging in 1000ft where there are a number of vulnerable skate species so we worked out a plan to try a catch and release photo shoot with some of the skates that he rescued from the nets. It should have been a simple way to nail some shots of never before photographed species but the best laid plans can go awry. While Brian was returning from his last fishing trip, I flew in, stashed my stuff at Joe's place and got ready to start shooting. Brian and his girlfriend Jen met me at a local beach and Brian pulled a tote of slowly flapping skates out of the back of his truck. When I found that he had managed to bring not one but three deep sea skate species I was as happy as a kid at Christmas. The plan was for me to swim out to clear water and release the animals on the sand and rocks where I could get some usable ID shots before they swam away. I was petrified that they would bolt before I could get any images but that turned out to be the least of my problems. R.I. is recovering from the worst flood in 200 years which has thrown millions of gallons of dirty water into inshore coves like the one we were shooting in. To make matters worse, the day we chose to release the animals, the weather was far from ideal. 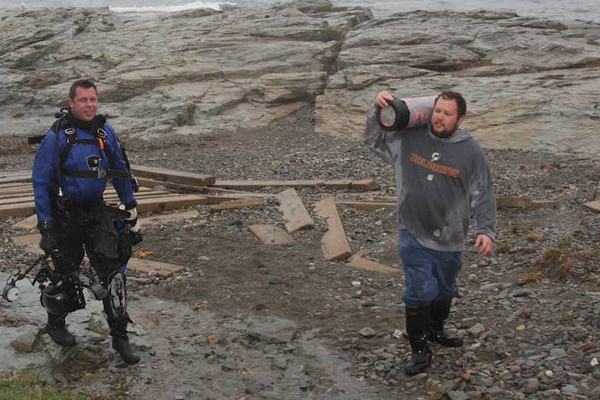 Strong winds, lashing rain and turbulent seas made the whole swim out from shore rather daunting. I went out for a test run just with my camera and found the going pretty tough. It didn't help that I was nursing a fever and a throat infection and apparently my drysuit had somehow gained a lot of extra buoyancy over the winter :) leaving me considerably underweighted. Unperturbed, I kicked back to shore, found some scrap iron on the beach and strapped it to my tank. Then, I filled my pockets with rocks and ventured out again, this time with my camera in one hand and a lobster trap full of deep sea skates in the other. Clutching such a voluminous object in rough seas put me in an unexpected position. I found myself at the mercy of the rip which dragged me out of the bay into an area that was churning like a washing machine. Looking down, the visibility was so bad that I couldn't see my camera dangling at my side, let alone photograph marine life. I tried retreating but I could barely make any headway back to the beach and I was slowly drifting sideways onto a patch of submerged rocks that was throwing extra large waves in my direction. I tried sinking under the buffeting chop but my drysuit inflator jammed open, lifting me back to the surface and filling my suit to Michelin Man proportions. I had no choice other than to disconnect the air hose but as the air trickled out, the sea trickled in and within a minute or two my suit was completed flooded. Now I was starting to feel a bit uncomfortable. I'm not one to panic but I was riding so low in the water that I couldn't tell which way the shore was. While I was deciding whether I should drop the lobster trap (making the entire trip to New England a disaster) I spotted Brian waving from the rocks with a pair of binoculars around his neck. With new resolve I inched towards shore. Cage in the left hand. Camera in the right. KICK! Look up. reorient to shore. Head down. KICK! It was slow going but I made it back into the shallows and dropped the cage in a sheltered spot to rest. 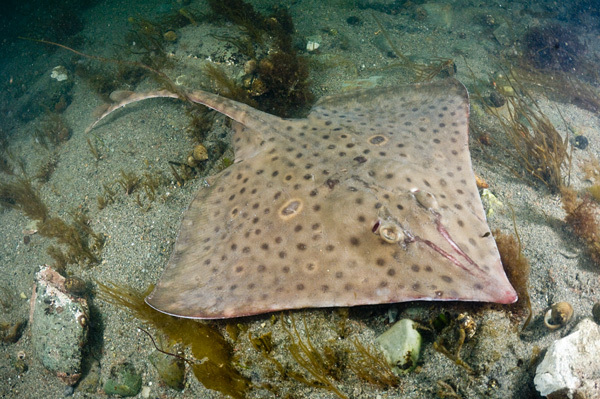 There was no way I was heading out to sea again so I gently lifted a skate out of its confinement and let it go. 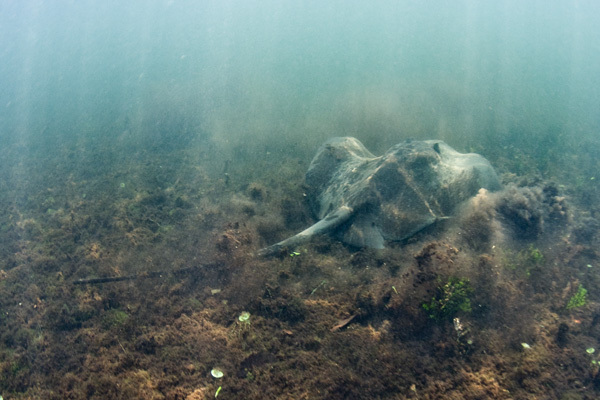 The skate swam around a little and then settled onto the sand, cupping its body to provide the suction necessary to resist the surge that was still pulling me around. By working with a fisheye lens within about six inches of each skate, I was able to get some images that looked like they were shot in much clearer water than they really were. After maybe an hour I dragged my wet and weary bones out of the bay and left the skates to find their way out to sea. That was two days ago and I'm still feeling whipped but the images came out great. Three more species for the Elasmodiver Shark and Ray Field Guide. Three more elasmos available for any conservation initiatives that might need images. Next stop Washington State for a couple of days diving on the Olympic Peninsula with Claire and then I fly down to Florida to lead a week long Photography shoot at Tiger Beach in The Bahamas. After that, the trip starts to get interesting! In other news, Sharkfest is getting exciting. As a new facet of the Predators in Peril Project we are starting a simple new campaign inspired by a constant flow of emails from people that want to do something to help sharks in their local communities. Its called the Shark Friendly Restaurant Initiative. The idea is for individuals to use fact sheets and decals that we will supply to approach restaurant owners in their communities that sell shark products (not just shark fin soup). If a restaurant agrees to become part of the solution, they get a Shark Friendly Restaurant Decal for their door and a listing in the Shark Friendly Restaurant Guide on Elasmodiver. Where possible, we will arrange for the campaign to be listed in local food and entertainment magazines so that conscientious consumers can learn what the decal looks like and patronize the right restaurants. Seafood Restaurants that already refuse to sell shark products get a decal right off the bat which will help to brand the idea. What does this have to do with shark diving in North Carolina? Well, the campaign is being sponsored by the profits from Sharkfest. If I manage to fill the boat, we'll have a budget to print enough decals to get started. You can find out more about the campaign at this link: Shark Friendly Restaurants. On a more fun note, we also have our first shark film submissions. The first to arrive was Big Fish Utila an excellent film about whale sharks in the Bay Islands. We'd like to have at least a dozen short films to view over the weekend so if you know anyone that has made a shark film recently or if you have a film of your own to submit, please tell us about it. Film submission is free. There has been a lot of interest in the trip but there is still room so if you would like to come diving with Sandtiger Sharks with us and a bunch of other shark fanatics for 3 days in early August please let me know. Sharkfest is $640 which includes 3 days shark diving, accommodation, a Sharkfest 2010 T-shirt and our 'shark friendly' Barbeque. 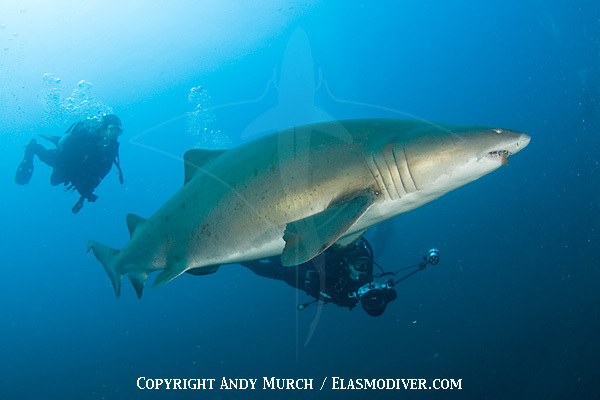 One shark diver suggested that we include a sandtiger night dive in the agenda. That sounds like fun to me but I'd like to hear what you think! The Tiger Beach Photography Workshop appears to be a very popular concept. I've never seen a trip fill up quite so fast. So... I'm considering running a second workshop/expedition in the fall. Email me if you're interested. Some people have commented that Elasmodiver is getting too big to navigate. No argument from me! So how do you get your head around a website with almost 500 pages? Its a puzzle but at least its easy to keep track of recent changes by bookmarking this link: Elasmodiver Updates. Its the simplest way to scan what is new, what has changed and when. And, if you have suggestions on how Elasmodiver could be made better, pleeeease let me know. 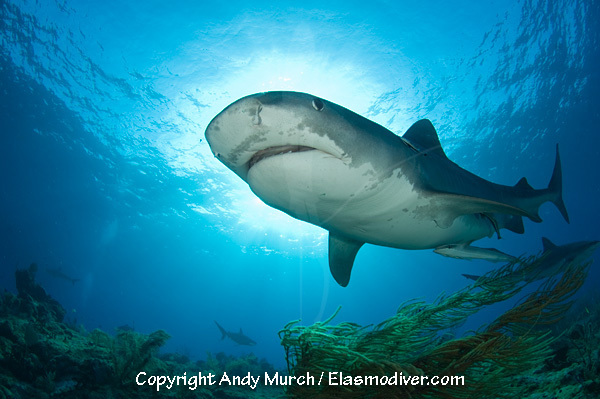 Elasmodiver remains one of the largest sources of shark info on the internet. Help us keep it user friendly. 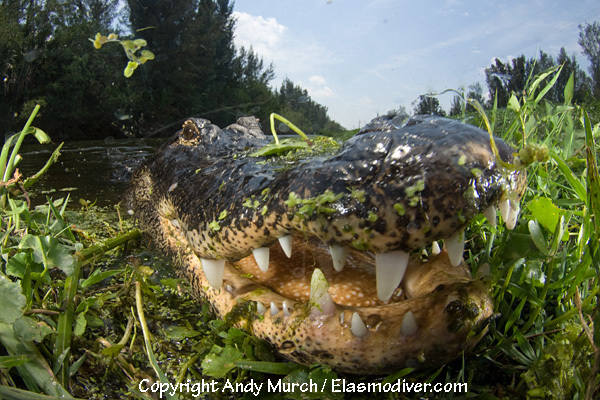 First the bad news... Our 2010 Central American Predators in Peril Expedition got turned down for funding. I'm not sure why but rather than dwell on the time wasted in drawing up funding proposals, I'm happy to move on and look for creative ways for us to fund the expedition on our own. Through a combination of revenue sources including Photography Workshops, Sharkfest, a pending photography exhibition and some good old fashioned hard work (at the Winter Olympics) we think we can pull off a modified PIP Central American Expedition that incorporates almost as much as the original plan. The new plan is to turn the proposed epic road journey into a series of fly in - fly out satellite trips. This ultimately works better because we can work on other projects in between shoots, we will have better opportunities to keep the world updated on our successes and we can avoid the rainy seasons much more easily by heading to the right places at exactly the right times. About a month ago I was looking at places around North America where I could run a cheap fun filled shark diving weekend. 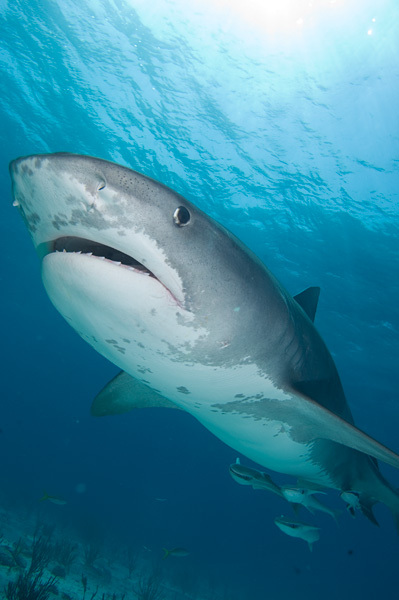 Moorhead City in North Carolina was the obvious place because it is easily accessible, warm enough to be popular and full of extremely photogenic sandtiger sharks. Olympus Dive Center (which is the premiere dive center in the region) was keen to host the trip so we started hashing out the details. 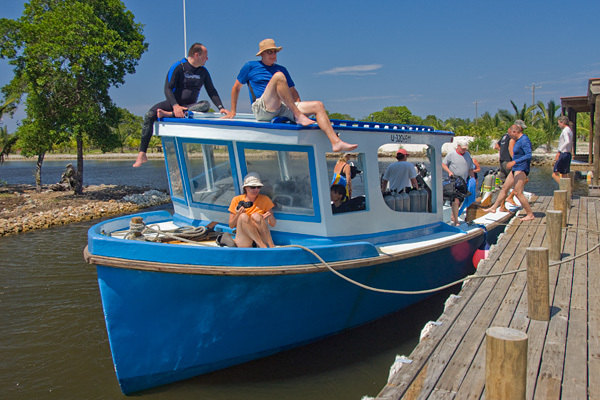 Shark diving trips with Olympus are always fun because they can cater to big groups and their store and staging area are set up well for apres dive entertainment. Rather than just a dive party I wanted to create an event that shark fanatics would really enjoy. 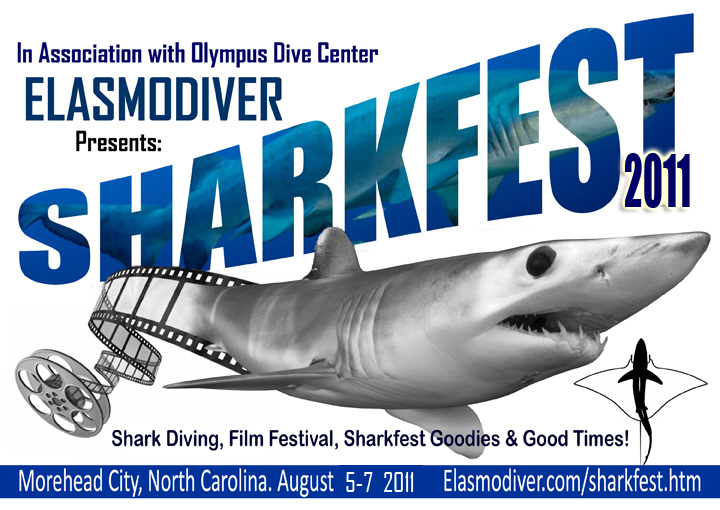 The result is Sharkfest - a shark diving weekend and mini film festival just for shark people. As soon as I mentioned the idea to people they started getting excited. Information about Sharkfest only went online just over a week ago and the first boat is half full already so I think it is going to be very popular. The good thing is that Olympus has two big boats so we could get a record number of sharky people in one place at the same time which is bound to be memorable. Attracting film makers to submit their short films will probably be the hardest part to organize but we have two films on the way already and screening times will be limited to the evenings. I hope I don't have to reject submissions - that would be tough. If you're interested in submitting a short but you're not sure if your shark footage is up to scratch don't worry about it. Sharkfest isn't Sundance or Cannes and you won't find a more appreciative audience anywhere! H2O Photo Pros in California has kindly offered to sponsor the festival with prize money and I am having a really special trophy made called an ELASMO for the crowd favorite. More on that when its done and I have a picture to show you. Right now we are at Olympic Village in Whistler BC. I am helping with some of the organizational nightmares of this monstrous event. As soon as the Paralympics finish in late March I am flying to Providence to dive with Film Maker Joe Romeiro. Joe has a friend in the commercial fishing world who is keeping an eye out for deep water species of sharks and skates for us. If he finds some while I am there we are going to do a captive release photo shoot. If any of you remember the 'walking the dog' blog that I posted during the shark tour this will be the same kind of shoot. 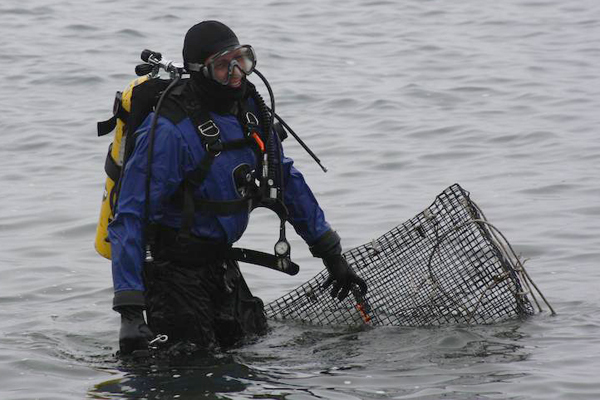 We'll release the deep water species in one of the bays and try to get some i.d. shots before they head for the hills. 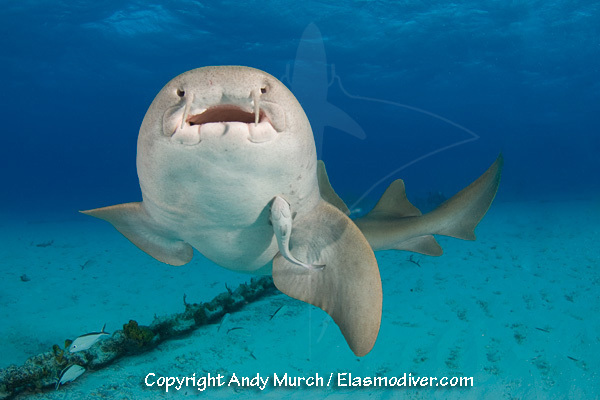 Its a pretty hokey way to shoot elasmobranchs but its the only way some species will ever be photographed unless I strike it rich and buy my own deep water submersible. I'm still working on that. 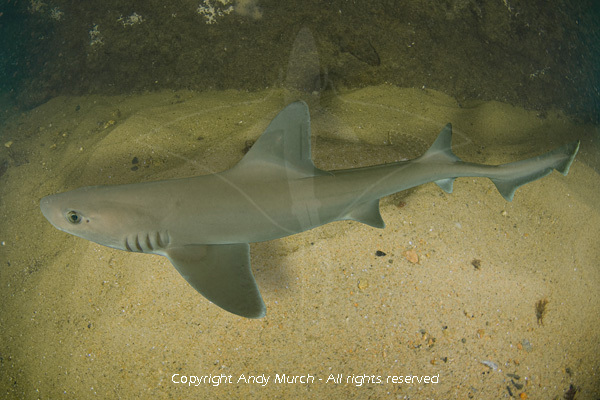 I have a local gallery interested in a shark photography exhibition. Dates have yet to be arranged but we're past the hand shake stage. The exhibition will be in two parts. 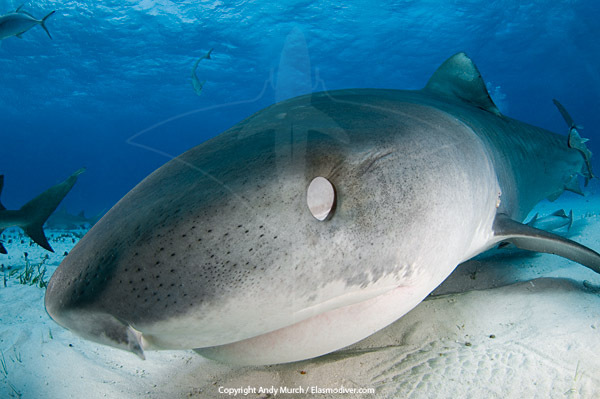 The first series of images focus on the traditional view of sharks, portraying them as majestic apex predators. The second series of images looks at the change that is starting to take place in the public's perception and the plight that sharks now collectively face. It contains enough 'pretty pictures' to make it appealing but also depicts sharks on long-lines and other unpleasant realities. I initially wanted to avoid any toothy shots that would paint sharks as aggressive animals but I've had a change of heart on this subject lately. Instilling fear into people is obviously detrimental to sharks but painting them as teddy bears is also foolish. Sharks are not monsters but they are formidable creatures. Hopefully my images will convey that sentiment. I have spent the last decade sliding over or diving into the ocean. Quite often, I was diving with sharks but sometimes I was just snorkeling and looking down longingly at the world below. Occasionally, I had the privilege of piloting submarines. ; driving over the seafloor, exploring the mysteries of the deep from the safety of my acrylic goldfish bowl. 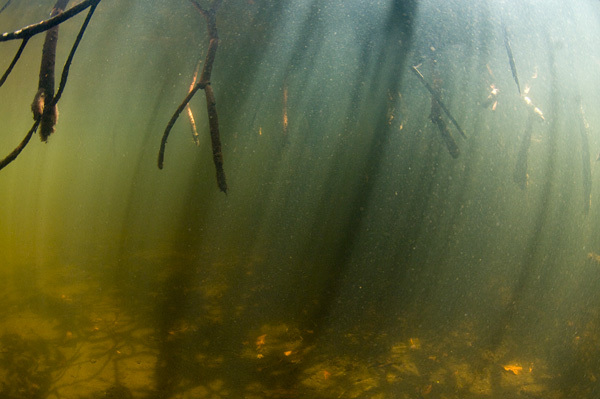 Every time I entered the water I came back nourished from the experience even when I was charged with difficult tasks. And, when I finally dragged my water logged body back to land, my mind remained deep in the ocean and there I expect it will stay forever. Of all the creatures that I encounters none affected me as strongly as sharks. Sharks have been such a captivating and pivotal force in my recent life that I now only accept jobs in places where I can find sharks and I scrimp and save to go to remote shark diving spots between shooting for magazine articles or sub piloting gigs. After I loaded Elasmodiver.com onto the web in 2002, I found even more reason to travel to unusual coastal destinations; the pursuit of rarely encountered species to add to the growing elasmodiver field guide. Initially, shark images were simply trophies in my collection. 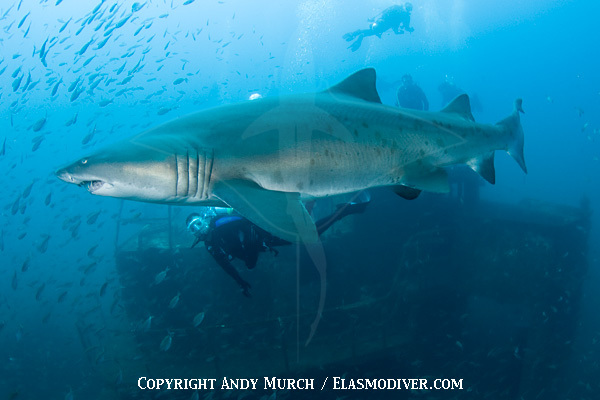 I was a big game hunter with an underwater housing and a bucket list of shark species that I wanted to photograph. I really didn't know that much about the plight of endangered species. I was simply overwhelmed by the beauty and grace of the animals themselves. I am still just as infatuated with elasmobranchs (large and small) but now I am also starkly aware of the sad decline of our ocean's top predators. 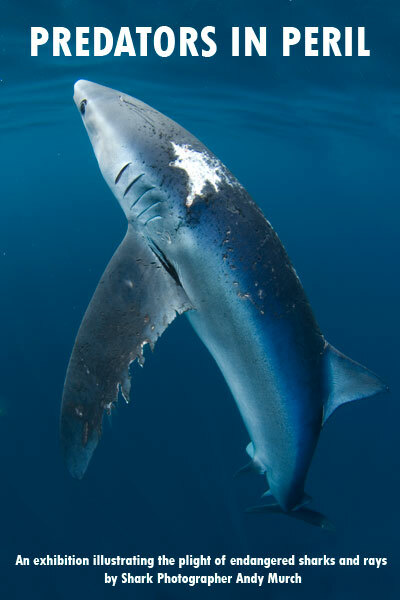 Regardless of the controversy over specific decline rates, few would disagree that many sharks and rays are in trouble. 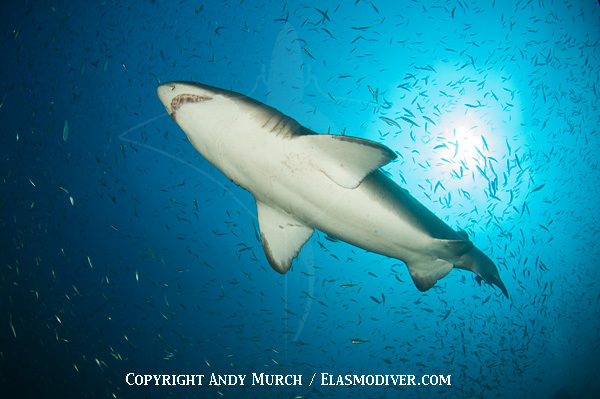 According to the IUCN, At least a third of the world's shark species are considered threatened. Many more are data deficient implying that further research could reveal more bad news. The enormity of the problem makes me feel pretty helpless. I want to do something tangible to help but I am just a photojournalist. I can tell people what I have learned but the people that read diving and nature magazines already love the ocean and the natural world. While its important to reinforce the message lest we forget, there has to be a way to spread the word to a wider audience. I'm not sure what the answer is or if anything can really be done to reverse the trend but I'll do my bit. In 2010 I am planning to play the part of a missionary and my mission is to bring the word about over fishing, shark finning and habitat destruction to people that still don't understand what is happening below the surface of the sea. I hope that you will all do your part too. Elasmodiver gets around 150,000 hits a month. That still blows me away! Not everyone that lands on the site wants to read about the plight of sharks but there are more and more shark conservation pages being added for those that care to look. I'm also trying to sneak as much conservation information as possible onto every page without turning people off. 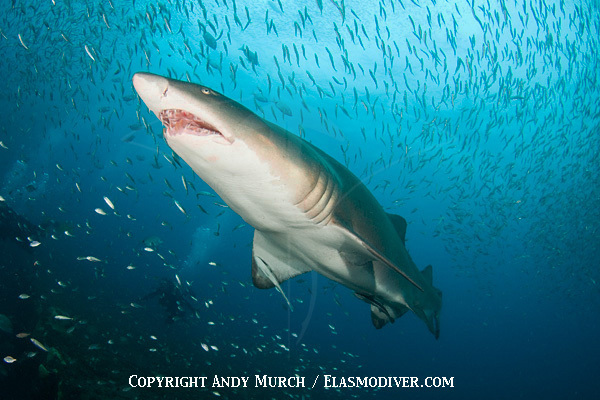 To that end, I am in the process of updating every species in the Elasmodiver Shark and Ray Field Guide with IUCN info. That means that when little Johnny cuts and pastes a page about great white sharks into his grade 7 school project, he inadvertently learns more than just how big they grow. It all helps. There are now Elasmodiver pages, channels and blogs on Facebook, Blogger, Wordpress, Twitter and YouTube. So, whatever way you like to get your news there is no escape from Elasmodiver. Don't sign up for our Twitter feed unless you want to live and breathe sharks. I am turning that account over to our new social networking guru Bo Moran. He'll be tweeting and re-tweeting Elasmodiver news and general shark stuff multiple times a day. The pen may be mightier than the sword but what is wrong with keeping a sword handy just in case? 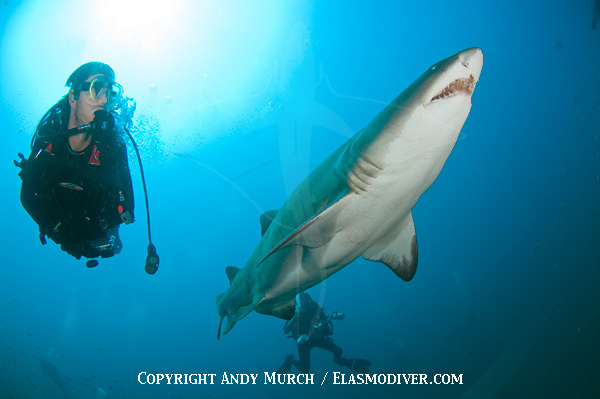 Outside of the web, I am now trying to write every shark diving article with shark conservation in mind. That's not always easy to do when you're writing about how much fun it is diving with tiger sharks but I'm committed to squeezing the message into the text wherever I can. I'm also pitching my stories to way more magazines this year. I'm a slow writer and I'm starting to think that I may be mildly dyslexic so its really cutting into my shooting time but its a worthwhile platform even if it is preaching to the choir. In the next couple of months, I have articles slated for Diver, Invertum, Oceans (a new mag - keep a look out for this one), Xray, Shark Diver (of course) and a few others that must remain nameless for now. I'll keep plugging away on that front so expect to see more of my writing on the news stands. I also contributed an interview for a photographic magazine which annoyed the hell out of me. No matter how many times I pointed out that I don't spend every waking minute 'in the jaws of death' they were not interested in any other angle. It frustrates me to think that many editors outside of dive/nature mags are still stuck on the sensationalist man-eater model - its time to claw your way out of the 70's guys!. At the end of the day I'm really not sure if what I write has any effect. I plan to keep it up but I look at Sea Shepherd and the front line approach that they have taken by harassing whaling ships and ruining catches and I wonder if that would be a more effective method in the battle to save sharks. I know that I'll be labeled as a radical if I go down that path but on a whim I registered SharkShepherd.com the other day. Every successful army has a political and a military wing. I'm not sold on the idea of direct intervention yet but I'm open to suggestion. I have invested a fair chunk of my net worth in this project. The images are printed on archival silver rag and they look gorgeous. The intention is to educate everyone that comes through the galleries and to raise funds for the 2010 Central American Predators in Peril EXPEDITION which will take place later in the year. One more idea. Life is short. Some people just want to get through it. Some want to make it fun. And some people want to lead an extraordinary existence. Its no secret which group I am in. The overland expeditions that I undertake are rewarding on many levels but there are so many more opportunities out there for the right people with the right ideas and the right budget. Have you ever wondered what it would be like to dive off of Tierra Del Fuego or the Aleutian Islands? 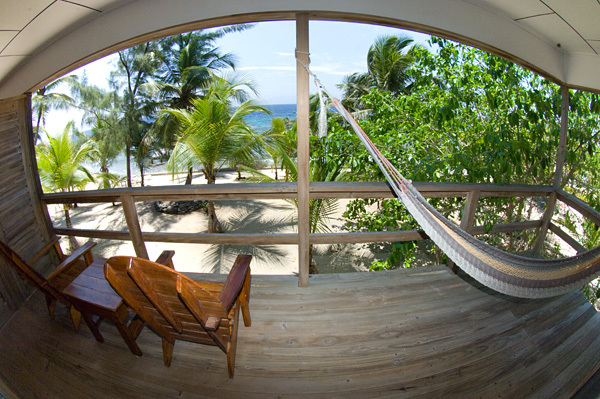 Can you imagine what you'd see if you spent a night at 100ft hanging from a baited line in the middle of the Pacific Ocean? 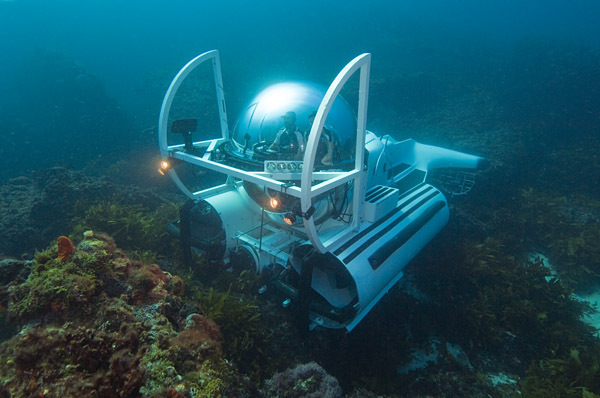 How about sliding over the sea floor in a small submersible at any number of unexplored abyssal reefs around the world. Does that sound interesting? Maybe such adventures would be disappointing. A waste of time and money. But maybe, with careful planning and the right people involved we can achieve the unthinkable, explore the unexplorable, and come face to face with the unencounterable. How about an expedition to find a giant squid or an illusive longfin mako or a mega mouth shark? Why are these creatures never photographed? Because its hard and because normal people don't go if the expedition might fail. Well, I want to try. If you are interested in joining me on an extraordinary expedition to encounter some of the rarest sights in the natural world then let me know. 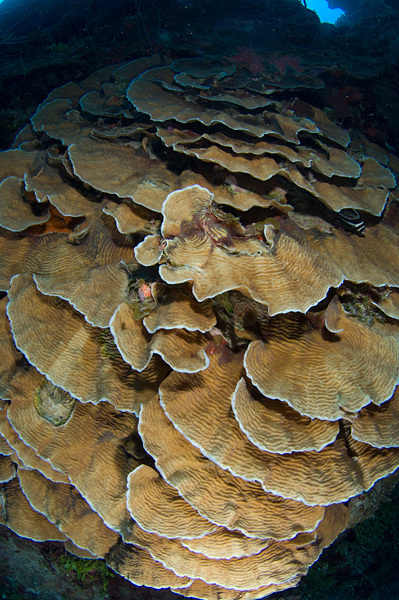 Right now Extraordinary Ocean Explorers is not a club or a society or a group. It is an idea. That is how it always starts. Someone with enough drive pulls together the right people to create an adventure that is bigger than the sum of its parts. Then it is up to you. If we try we may fail. If we don't then we will definitely fail. If you want to be involved with the development of upcoming expeditions email me and we'll talk. Happy new year! Thanks for tuning in and for supporting Elsmodiver. 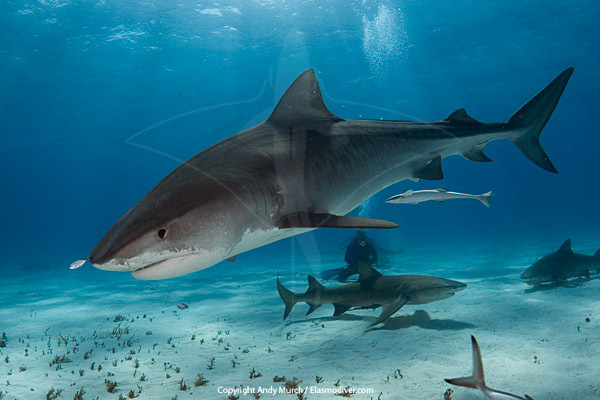 Shark Pictures, Shark Projects and Shark Photography Workshops! To quickly outline the mission: Beginning in early May, we will be traveling through nine countries along the entire length of Central America to photograph new species of sharks. We have arranged to work with local researchers in many locations and we will also be working with artisanal shark fishermen and with a number of Central American dive operators. 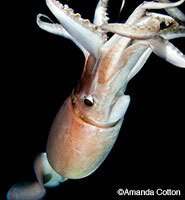 We are hoping to photograph at least a dozen new species that have not yet been documented in the wild. The images will be used in an extensive public awareness campaign and then offered to regional conservation groups to promote local conservation initiatives. We have put in a couple of funding proposals but we still need help with equipment and field expenses. 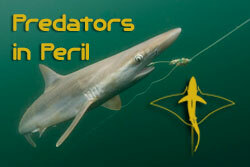 Please take a look at the Predators in Peril Expedition Wish List if you think you may be able to help. And, please spread the word about the expedition through any networks that you are involved with. Media coverage is a very important part of the project. In other news, I have just returned from Tiger Beach in the Bahamas. It was an unexpected last minute shoot that I almost didn't go on but I'm glad I did because the sharks were VERY friendly on this visit and the shooting opportunities were outstanding. If you've never been to Tiger Beach you'd be forgiven for imagining a palm fringed island surrounded by big striped sharks but TB isn't actually a beach at all. 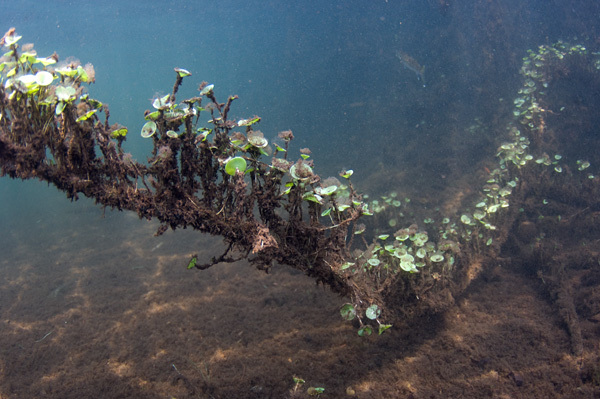 It's a sand bank in the middle of nowhere that rises to within about 20ft of the surface. 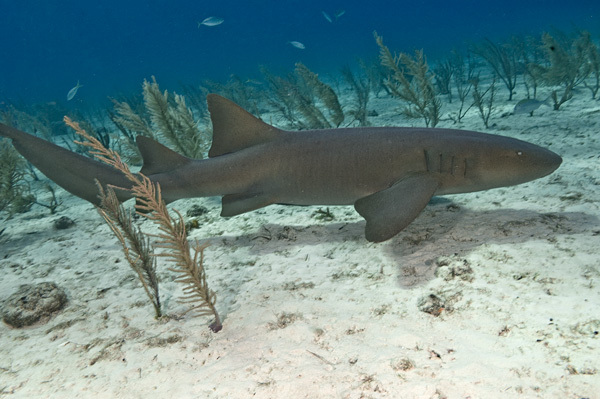 The lemon sharks that patrol the area have become accustomed to the occasional dive boat passing through and the sound of an anchor chain rattling down to the seabed acts like an aquatic dinner bell. For first time visitors it can be very daunting seeing a score of large lemon sharks circling just below the swim step but lemons tend to be pretty well behaved sharks. Tigers (in my opinion) are a little more unpredictable. The tigers usually show up in ones and twos but you never really know what Tiger Beach will dish out. I've heard of divers encountering a dozen tigers on a single dive. I'm sure that would be fun for the adrenalin junkies that go shark diving for kicks but it would make my job a little tricky so I'm glad that we only saw a handful of tigers over the course of the week. I need an accommodating shark that is bold enough to come in close and pose but doesn't get out of control and swim off with the bait box. The 4 meter female that adopted us on this trip was almost the perfect shark. 'Fluffy' as we called her, was a beautiful animal that moved slowly among us for the better part of two days. Judging by her distended belly she was either digesting a turtle or almost ready to give birth to the next generation of baby tigers. After Tiger Beach I had a week to kill in Florida which would normally have involved lots of snorkeling with stingrays and hunting for little coastal sharks but I'm ashamed to say that I barely got wet even though I was holed up right next the beach in Fort Lauderdale. I spent the week sitting in a darkened hotel room cleaning and sorting all of the images that I have taken this year. It was a mammoth undertaking but I'm finally caught up (almost). Pretty soon there will be a whole lot of new images on Elasmodiver.com - I promise! While in Florida I attended DEMA - the yearly North American Dive Industry Bash. I'm glad I went because after 4 days of schmoozing with magazine editors and dive operators I walked away with lots of exciting plans for next year. So many plans in fact that there is no way I can work on them all, but even if I make half of them happen it is going to be an amazing 2010. 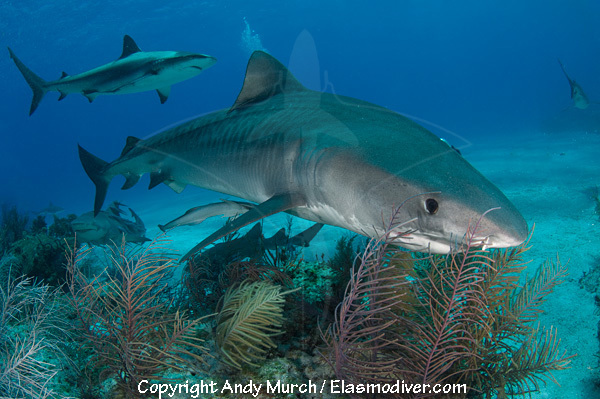 One tentative plan I have is a Shark Photography Workshop in the Bahamas. This is a new direction for me. Other professional shooters have done similar workshops but I have been biding my time until I was sure I had something worth offering. Now I'm ready. 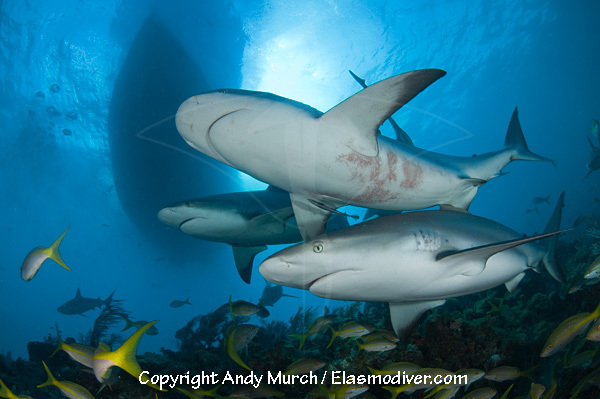 We're looking at a 3 or 4 day shoot, mostly working with Caribbean reef sharks in different environments. Two dives a day plus 'how to' workshops, photography critiques (don't be shy) and daily slide shows. The idea is that you walk away with some good pics, a better understanding of how to shoot sharks and some great stories about the crazy time you had with a slough of other shark shooters in the Bahamas. Space will be limited so if that sounds like fun let me know! 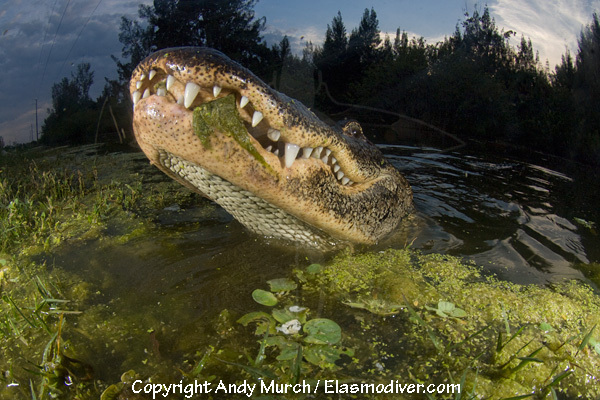 Depending on interest, I'm hoping to set some dates in April before the Predators in Peril Expedition gets underway. The Elasmo T's are US$22. All proceeds go towards the Predators in Peril Project. 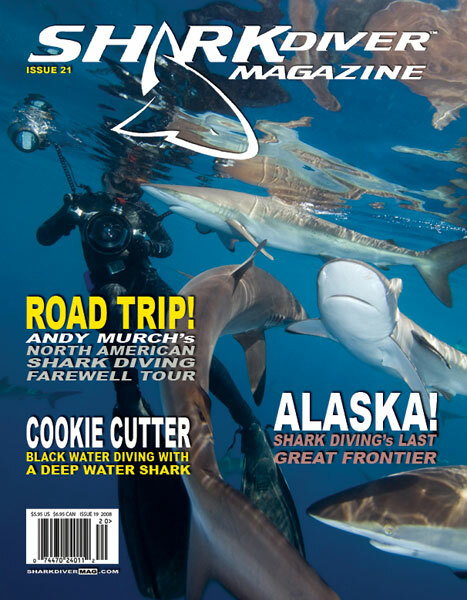 Tomorrow I leave for Cabo san Lucas in Baja to shoot Marlins with Shark Diver Magazine. "MARLINS?" I hear you say. Well, its a trip to shoot marlins attacking bait balls. Don't tell the editor but I'm only going incase some sharks show up to feed as well. If they do, I'll just have to wait for those pesky marlins to get out of the way so that I can get the shot. An exhibition featuring a selection of dynamic shark and ray images designed to draw attention to the critical position of critically endangered elasmobranch species. This will initially start locally but if it is well received I will try to turn it into a traveling exhibition. It is a great opportunity for me to get on my soap box in a friendly setting to reinforce the message that shark stocks are in decline and need to be protected at a global level. There are a lot of obstacles holding the project back such as: set up, printing, framing, venue hire and advertising expenses but we have high hopes for pulling this together by the spring of next year. The original mandate of Elasmodiver was to create an exhaustive shark and ray field guide on the internet where divers could look up a particular species that they were interested in and immediately find out where they could dive with it. Well, eight years later I'm nowhere near finished but I think that I've made a pretty good start. One of the factors holding the project up is that I still don't know where each and every elasmobranch is hiding and when dive operators are talking about their dive sites on the internet, they don't usually bother saying that stingray species A is sometimes found swimming around at dive site B. Consequently, I've decided to approach the problem from another angle. 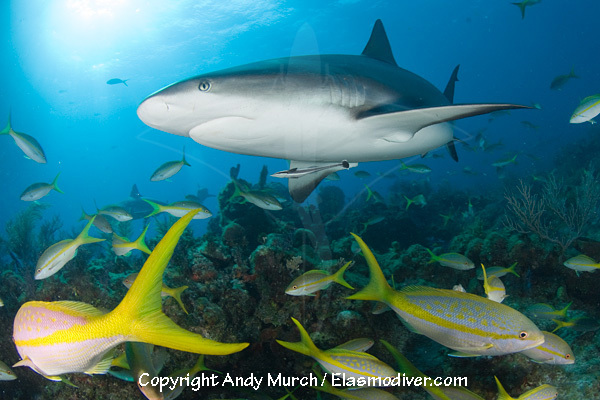 The Shark Dive Operator Initiative (I'm still working on the name) is an email campaign to get every dive shop or dive operator that we can find on the internet (not just those that run organized shark dives) to fill out a quick survey answering which shark and ray species they see in their neighborhood. No surprises here. 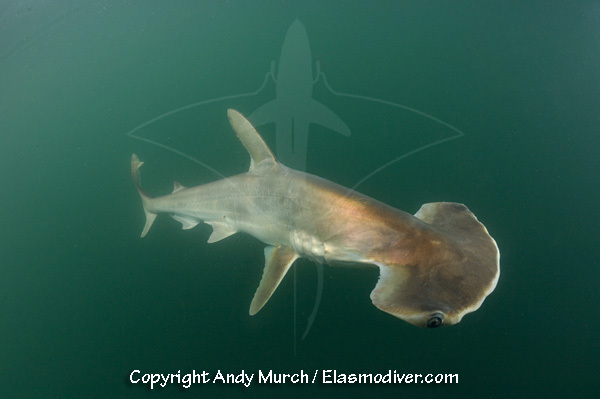 I'm swamped with new shark and ray images from the 2009 tour and it is going to take me months to add them all onto Elasmodiver. There are at least 6 new species profiles to be added to the Field Guide (like the Atlantic Guitarfish shown here) as well as location pics, some new 'shark diving hot spot' features and lots more that I don't even want to think about right now. 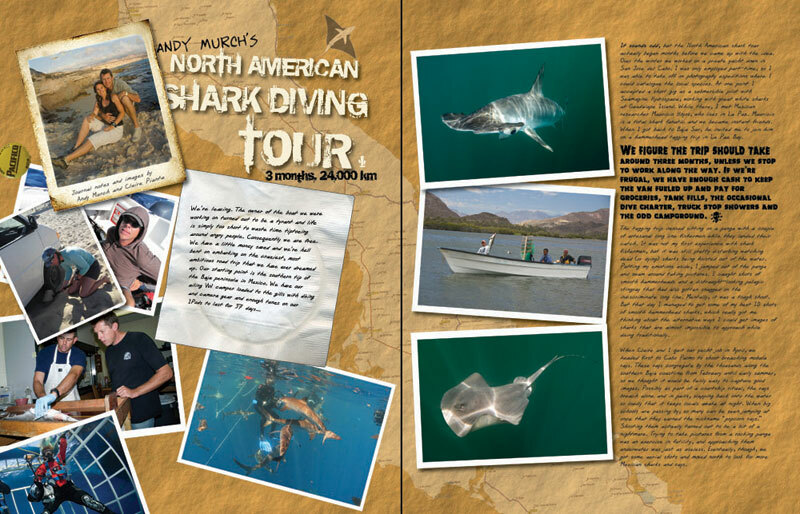 Some of you may have heard that Eli was so inspired by the North American Shark Diving Tour that he decided to dedicate the next issue of the mag almost exclusively to our adventures. That was a nice gesture on his part but the reality is that after I agreed in principle, I soon realized that I would have to rewrite and expand upon my entire road trip blog so that it would read well in a magazine. And, sort, clean and edit lots and lots of pics so that Eli can cherry pick his favorites. It is very time consuming but its kinda fun reliving all the high points and writing about them from a more retrospective point of view. 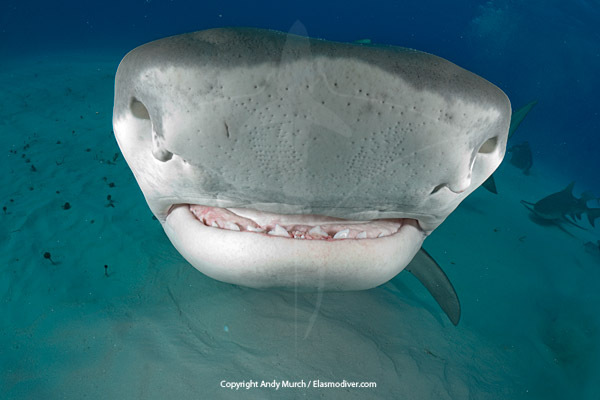 A month or two ago a friend of mine started an Andy Murch Shark Photographer Group on Facebook. That was going well but I couldn't figure out how to keep everyone updated unless they actually visited the group to see what had changed. So now there is a simple page that anyone can join. Once you join Elasmodiver (or become a fan of it) on Facebook you'll get all my website updates zapped straight to your Facebook status updates page - much easier for me to manage. The Shark Safe Network provides a framework to combine and focus the efforts of committed individuals and shark conservation groups towards specific shark conservation campaigns. If you have a passion to protect sharks, Shark Safe Network helps you to get involved and make a difference - by participating in a current campaign or by launching your own campaign in your community. 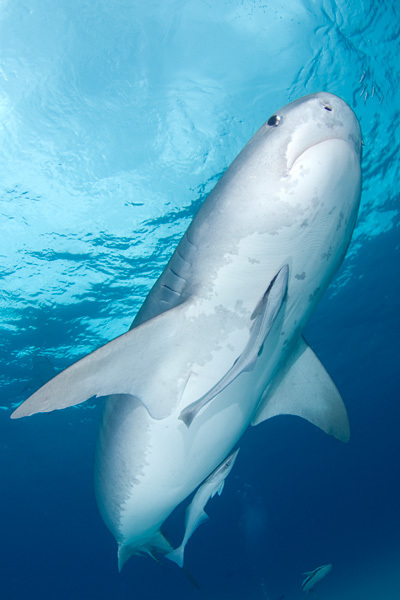 Shark Safe Network provides the information, tools, raw materials and support. You provide the passion!! 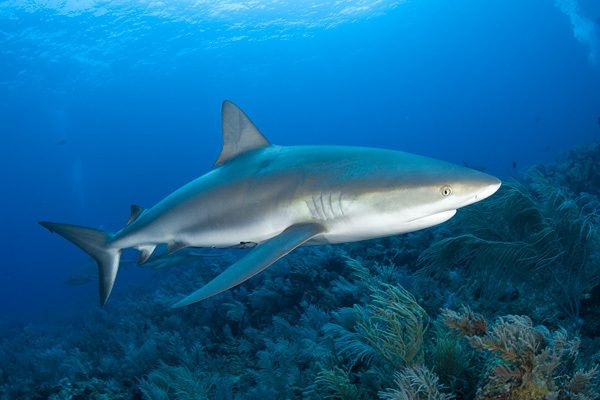 The goal of every Shark Safe Network campaign is to reduce and ultimately eliminate wasteful and unsustainable activities and products that threaten sharks' survival. Shark Safe Network invites and welcomes participation from any and all organizations and individuals, provided that all campaigns are conducted according the Shark Safe Network campaign principles. And we always keep in mind that helping sharks = helping people. When you consider any of the issues that threaten sharks today, there is also a corresponding negative impact on humans and the planet. Shark Safe Network is all about getting involved and doing something that counts. Join the Shark Safe Network and you will make a difference! Many organizations have already endorsed the initiative so if you're looking for an effective way to make a difference, take a closer look at what the SharkSafeNetwork is trying to do. There are lots more projects that I would like to start at some point but these will keep me busy for a while. I am planning to go to DEMA in November so if you see me wandering around in an Elasmodiver T-shirt please come up and say hello. It'll be a busy weekend but there is always time to talk shark.